Over the last century, giant agribusiness interests which came out of the war industry have poisoned life, our ecosystems, destroyed our biodiversity and pushed farmers off the land. As these corporations become bigger, they gain more power, more immunity and more rights. Using free-trade neoliberal policies and deregulation of commerce to enlarge their empires, these corporations are attacking life on earth and biodiversity. They have broadened their control over our seed, our food and freedom, robbing us of our human rights and democracy. They have established monopolies and threatened farmers’ rights to seed and people’s rights to affordable medicine through patents and IPRs. Monsanto has emerged as the biggest destructive force in agriculture over the last 20 years using GMO myths, patents, free trade and toxics to monopolise our seeds and poison our food. 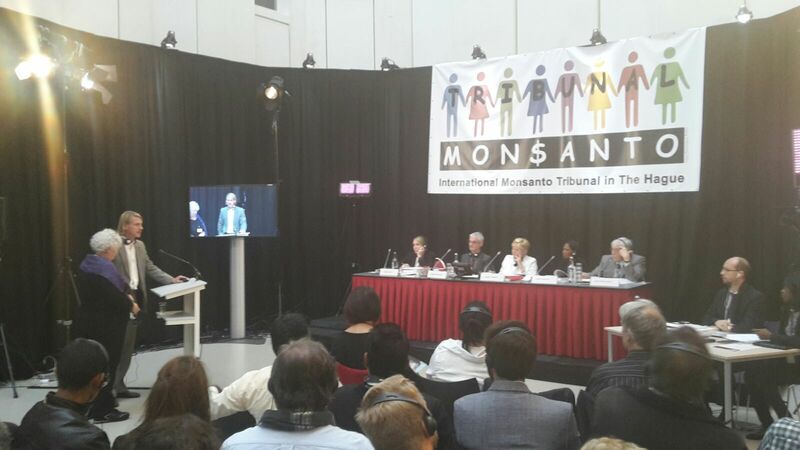 The Monsanto Tribunal and People’s Assembly took place in The Hague between the 14th and 16th of October 2016 to hold Monsanto and co. accountable for their crimes against humanity, human rights violations and ecocide. The process of holding the Poison Cartel accountable for its crimes is the culmination of 30 years of scientific, legal, social and political work by movements, concerned citizens and scientists. As Vandana Shiva pointed out in her Call To Action 2016, we face social, economic, and ecological collapse in every corner of our world. Big Industrial Agriculture is a major contributor to this collapse. While having destroyed 75% of our soil, water, and biodiversity, and contributed to 50% of climate change, this model, that has its roots in war, produces only 30% food. The real food producers are our pollinators, soil organisms, and biodiversity and small farmers who – as co-creators and co-producers with nature – provide 70% of the food which is nourishing for the planet and people. In the last century, today’s big agribusiness corporations with roots in war have poisoned millions of people, destroyed biodiversity, pushed small farmers off their land, and attempted to take over every aspect of our life. The entire industrialisation of food, agriculture and life is based on the false claim of feeding the world, when the reality is that an agriculture that has been shaped by the war industry is at the root of the hunger and malnutrition in the world. Equally erroneous are the claims that industrialised agriculture produces higher yields and reduces the use of pesticides when reality has shown that the opposite is true. In 2009, the wide-based United Nations and World Bank IAASTD report asserted that chemical-intensive industrial agriculture has degraded the natural resource base on which human survival depends and now threatens water, energy and climate security. Continued reliance on simplistic and often expensive technological fixes—including transgenic crops—is not a solution to reducing persistent hunger and poverty and could exacerbate environmental problems and worsen social inequity. Technologies such as high-yielding crop varieties, agrochemicals and mechanization have primarily benefited transnational corporations and the wealthy, rather than the poor and hungry of the world’. Using free trade neoliberal policies and deregulation of commerce to enlarge their empires, these corporations are not only attacking life on earth and biodiversity, they are also attacking our democratically written laws and democratically shaped policies made in the public and national interest. They have broadened their control over our seed, our food and freedom, robbing us of our human rights and democracy. They have established monopolies and threatened farmers’ rights to seed and people’s rights to affordable medicine through patents and IPRs. Corporations like Monsanto, Bayer, Dow, Dupont, Syngenta, all have their roots in warfare and through free-trade neoliberal policies and deregulation of commerce, they enlarge their empire with mega buyouts. Such is the case with the most recent bid by Bayer to buy Monsanto for 62 billion Euros, facilitated by the European Central Bank. This in effect means public money being used to strengthen the monopoly of destroyers of life and people’s rights. These hallowed corporations of today, that have been tried and tested for crimes against humanity in the post war years, continue to use the same poisons that kill, but under the guise of being saviors of humanity. As Earth Citizens, we have a duty to protect the earth and we have a right to protect our lives and those of future generations. And even while we try them for their crimes we must celebrate life on earth and our capacity to work with the earth as co-creators. While looking at how the WTO and Free trade policies introduced patents on seed and promoted the GMO invasion, we will also look at the new free trade agreements like TTIP and TPP. Through the experience of ecocide and genocide of the last century, we also chart the road to our future based on Seed Freedom and Food Freedom, agro-ecology and farmers’ rights, our commons and economies of sharing, rights of nature and earth democracy. 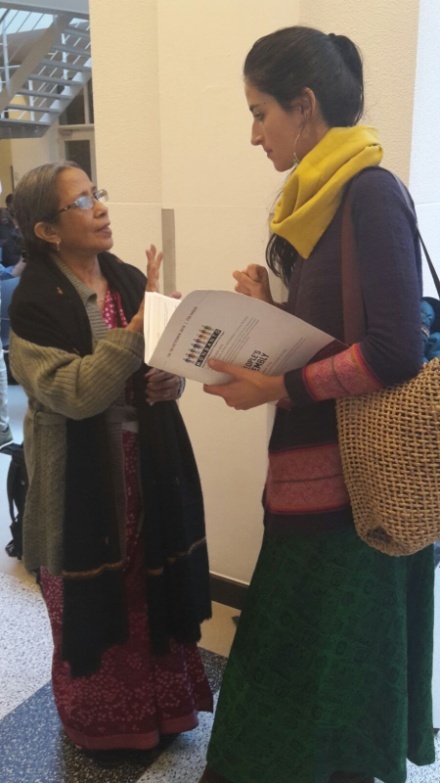 The Tribunal aimed to synthesize the existing crimes and violations for which Monsanto+Bayer are in courts across the world – in India, Europe, the US, Mexico, Argentina – as well as to expand the scope of criminal activity to include the crime of ecocide, the violation of the rights of nature, as Vandana Shiva explained in the columns of Common Dreams. 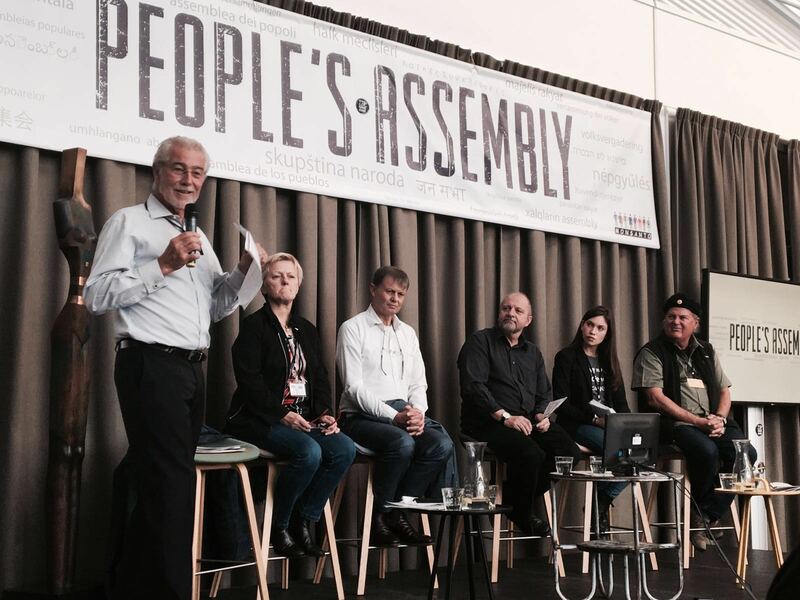 Alongside the Tribunal, which aims to investigate crimes of the Poison Cartel, People’s Assemblies are being self-organised by local communities throughout the world to establish a worldwide network in order to create a healthy future of food and of the planet. 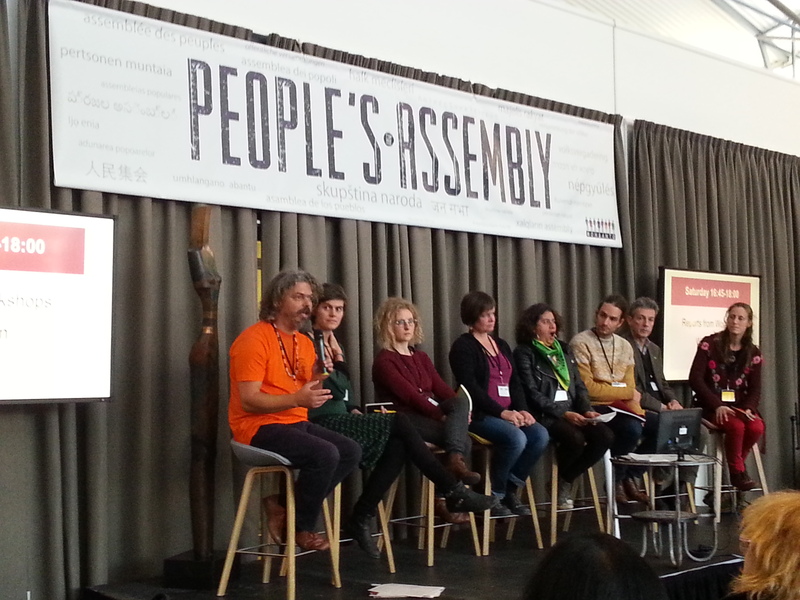 The People’s Assembly website gathered information about the assemblies from across the world with a special focus on the Assembly in The Hague, a gathering of movements, seed savers, seed defenders, farmers and growers and civilians to address the crimes against nature and against humanity perpetrated by chemical and biotechnology corporations. 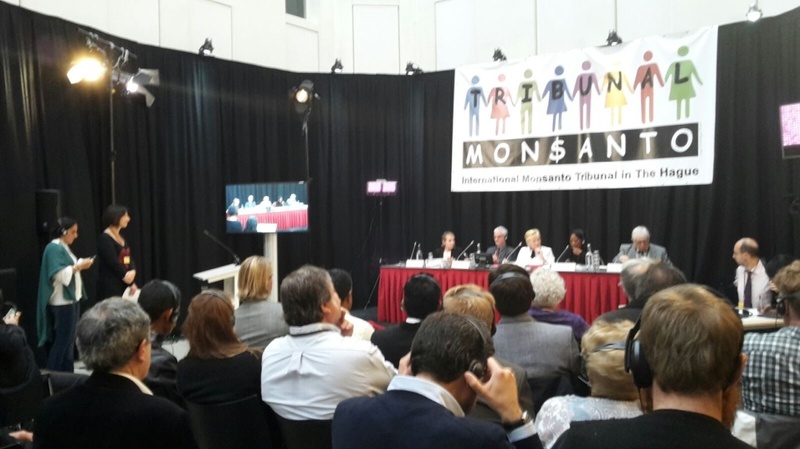 The Monsanto Tribunal and People’s Assembly, supported by almost 1000 organisations worldwide, attracted attention from media worldwide, not only for their capacity to investigate the main topic related to the impact of industrial agriculture on people’s life, but also to establish links with very urgent topics such as free trade agreements, corporate lobbying, and democratic processes, among others. 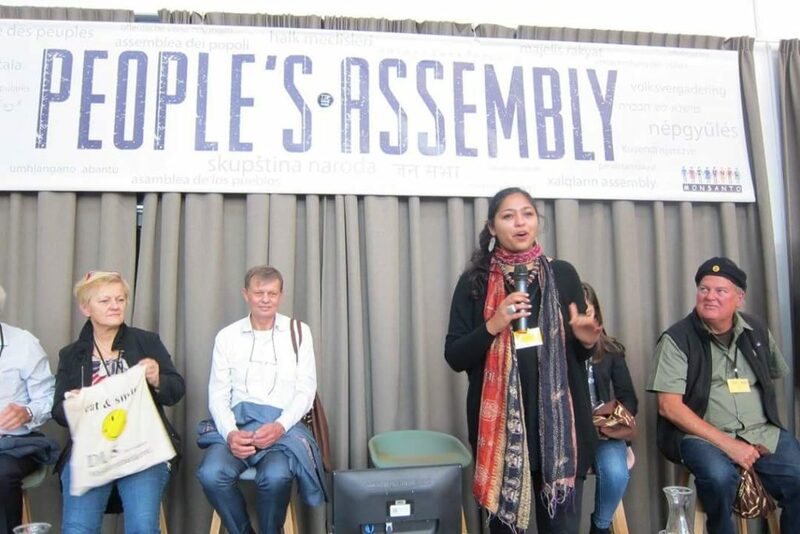 In the course of the year, Navdanya mobilised movements and organisations throughout the world to participate at the Monsanto Tribunal and People’s Assembly; they were also invited to organise local People’s Assemblies everywhere to reclaim our food system. A Call to Action to end dictatorship over seeds, over life, over our food. As part of the Tribunal build-up actions, people and organisations from all over the world attended the 16th Seed Festival at Peliti, Greece which represented a unique opportunity to build connections and strengthen the movement to shape Food Systems that produce more food, better food, more livelihoods, more meaningful work, more democracy, more freedom. In India, civil society and Gandhians from all over the country gathered to stand against the poison makers that are pumping India with disease and death. Indian farmers called for ‘Monsanto Quit India’ and demanded that the government not only regulate prices of Bt cotton seed but also ban Bt cotton entirely. 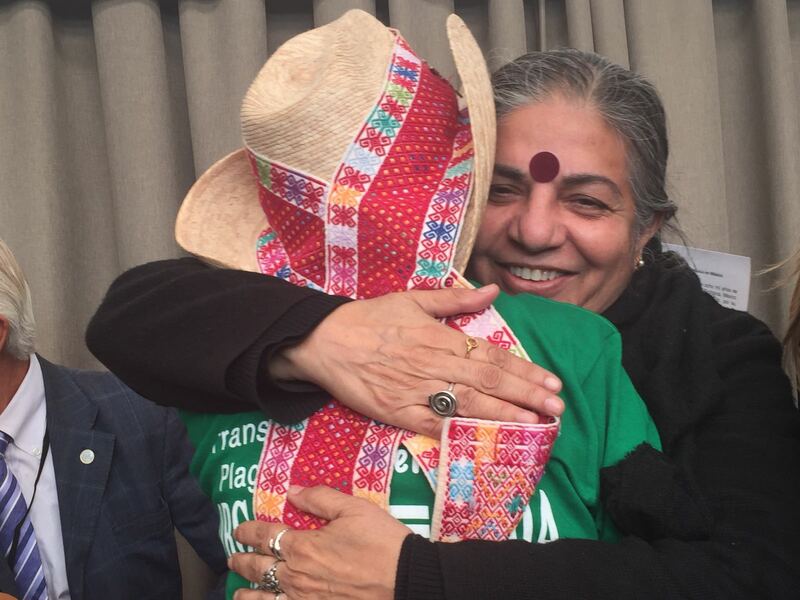 Dr Vandana Shiva wrote to the Indian Prime Minister Narendra Modi to take cognizance of the violations of Indian Intellectual Property Rights (IPR) laws and of the Competition Act (Anti-trust and monopoly Act) by Monsanto, further demanding that Monsanto be banned from India. 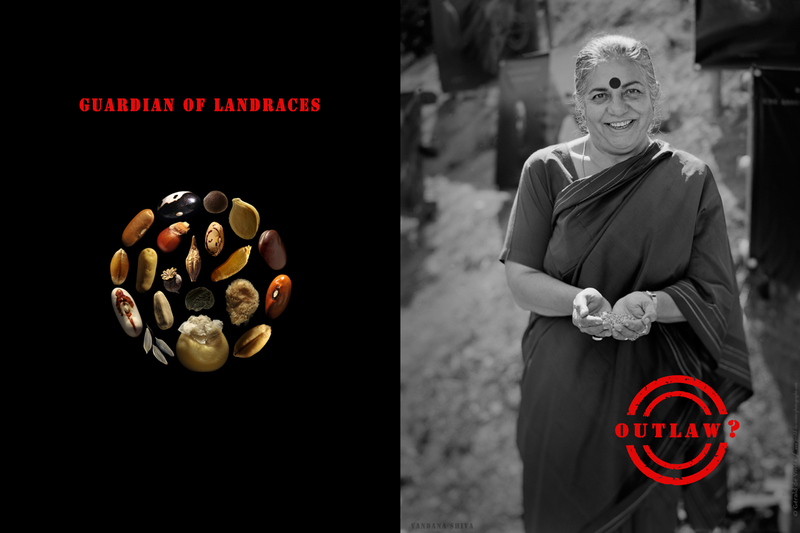 Many initiatives like those in Greece and in India took place in different countries throughout this year to join forces and collectively defend our Seed Freedom, Food Freedom and Democratic Rights to shape the future of food that protects life on Earth and the well-being of all. 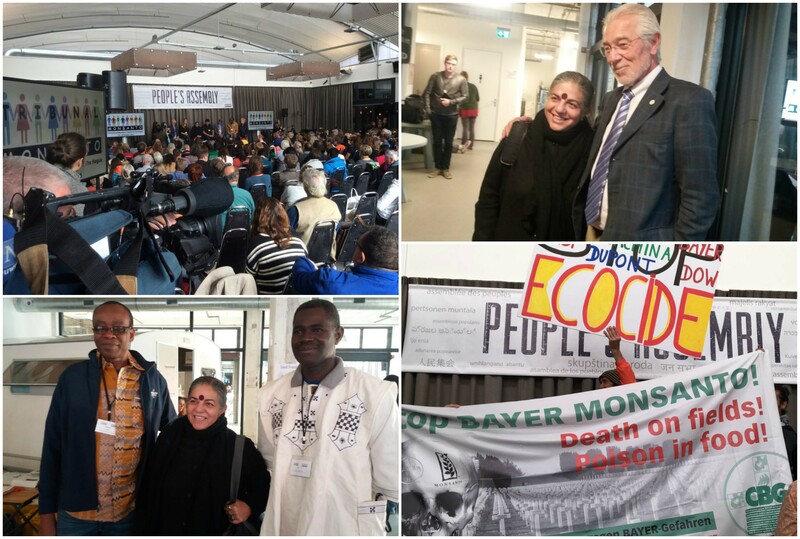 On October 14th in The Hague, millions represented by farmer groups and activists across the globe launched the People’s Assembly and Monsanto Tribunal. 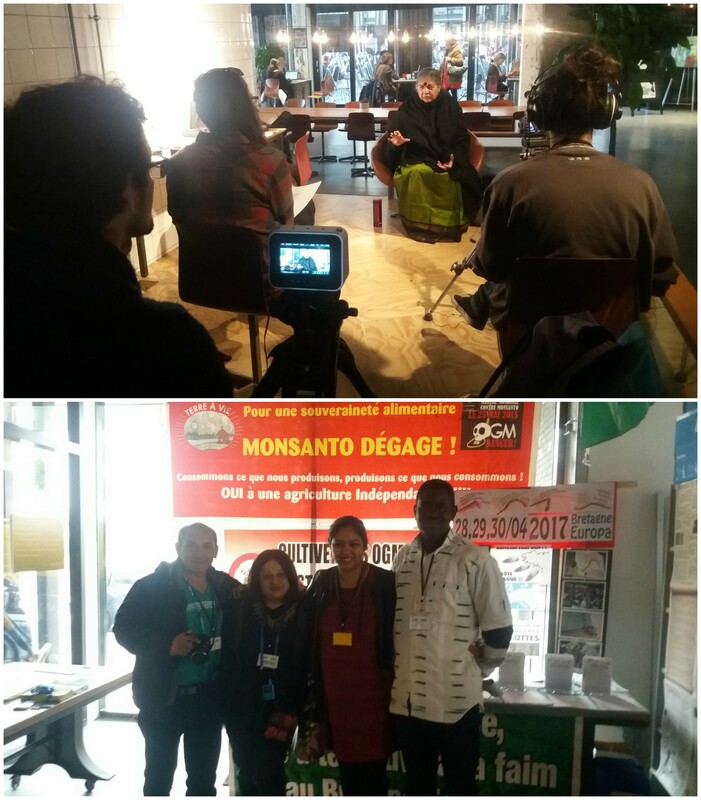 The day started with a press conference of the Monsanto Tribunal & People’s Assembly organising committee, including: Vandana Shiva, Corinne Lepage, Emilie Gaillard, Mindy Schneider, Hans Herren, Ronnie Cummins, Andre Leu, Nnimmo Bassey and Renate Künast. 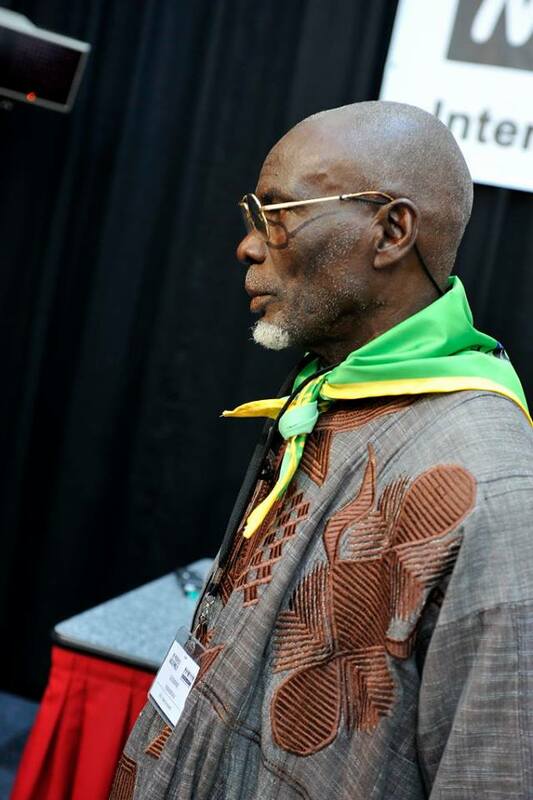 They spoke of the necessity of a people’s grassroots movement in the face of governments and international institutions’ inaction in protecting human rights. First to speak at the Press Conference, Ms Corinne Lepage immediately addressed illations around the Tribunal being “a masquerade” with no real legal leverage: “The goal isn’t to give a nominal sentence. We are asking for an advisory opinion, to open a new way of thinking, a new way of legal thinking by real judges. The key idea is ecocide – acknowledging threats to the environment in a holistic way – and we seek to get ecocide considered a legitimate legal idea”. Link to video. 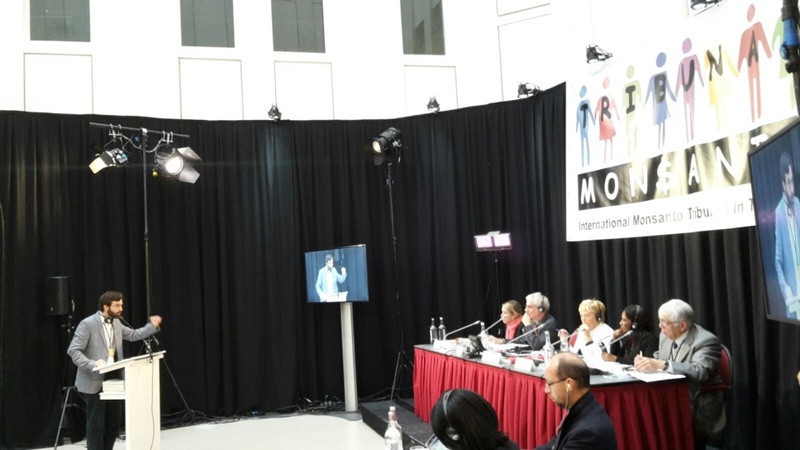 Following the same line, second speaker Emilie Gaillard reprised: “We will create a brief to open a new way of reasoning in law with concrete the threats that will be presented at the Tribunal. The idea is to enrich legal reasoning in international law. Last month the ICC said they are starting to look at crimes against the environment as crimes against humanity. It seems the way is opening to protect the environment, the earth, and future generations and this is a strong change of the paradigm. There is a confluence in the way of legal thinking and a new organisation around the world – in Argentina, Hawaii, here, and in many other places. We are seeking to strengthen this convergence”. Link to video – Link to video. The intervention by Ronnie Cummins, Organic Consumers Association International Director, focused on strategies for international grassroots cooperation: “We have to get organised across borders, it’s the only way we are going to solve the crisis of exhausting our resources, it’s the only way we are going to address this endless war that’s going on right now in places like Syria and Iraq. We all have to become anti-war activists, food activists, what we need to do is not just organise millions against Monsanto, but organise billions against Bayer. We’ve got to come together in 200 different nations. This is a spiritual revolution we are talking about. Let’s come out of here with a fierce determination that if the governments of the world won’t usher in a new era, we the global grassroots will do it!”. Link to video. Also read: Letter from The Hague by Organic Consumers Association. 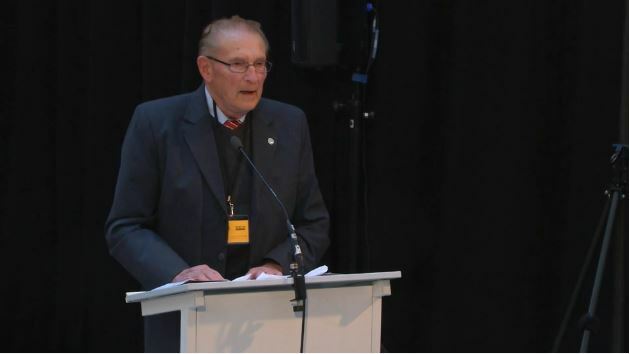 IFOAM president Andre Leu continued on the subject of ecocide, remarking: “We talk about ecocide, but we’re also really talking about genocide too. Children don’t have the enzymes in their liver to break chemicals like Glyphosate down. So there is no safe level for children. All the testing Monsanto does is on adult animals, and their testing does not take in consideration the fact that children cannot tolerate any amount of these chemicals. Published peer reviewed science shows clearly how glyphosate causes cancer, birth defects, and disrupts hormones. And epidemics of child obesity, diabetes, and autism are growing through the roof. The biggest crime is why are we poisoning our future – our children?” Link to video. 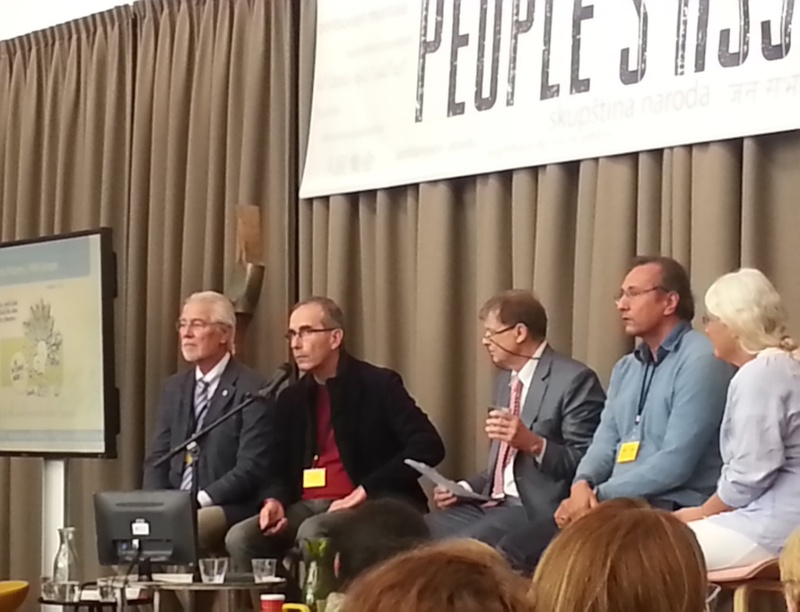 Also read: Andre Leu, IFOAM President, at the People’s Assembly and Monsanto Tribunal. The following intervention, focusing on consumer power, was that of IAASTD chair Hans Herren, who noted: “It is not enough to just feed the world, we want to nourish the world. We need more health per acre, not kilograms of starch per acre. I mean, how much more evidence do we as consumers and policy makers need? If it’s not us, if we don’t change the way, and we behave like nothing will change… In the end, I have come to the conclusion that farmers will grow what you as a consumer choose to buy. As such, we need to vote with our feet, our wallet, we need to make sacrifices, or nothing will change. Lest things escape our reach, like Glyphosate. Glyphosate started as a pipe cleaner, now we eat it (…) we must come to our senses! We need to get back to reality: 60% of what you have in your plate needs bees. Alas, today it’s all about business and short term cycle. This has led to mergers and companies too large to be held accountable in front of the law. Yet today, we have accumulated in seeds a huge amount of power. However, that power is getting lost by the minute by companies that are acquiring them”. Link to video. Nigerian Health of Mother Earth Foundation representative Nnimmo Bassey’s intervention stressed food’s identitarian aspect: “Being an ambassador of this Tribunal is to be an ambassador to Mother Earth. If mother earth were to speak, Monsanto would be in jail long ago. Food is a celebration. Eating is a culture, a way of life. This tribunal isn’t a struggle against a single corporation – it is a struggle for life, for freedom. It is a struggle from big companies holding mother earth as a slave for their profit. This is a very important moment for the future of humanity and for the future of our planet. To stop the toxic poisoning not just of our food systems, but our water systems. To stop the grab of our liberties just because the corporations have the power. I want to invite us to open our hearts and get ready to join hands in the struggles ahead. We will analyze and see that we are all together in this struggle”. Link to video. 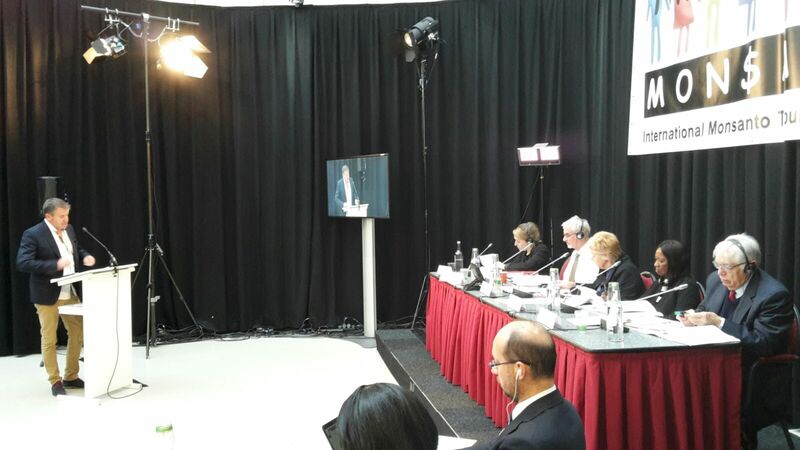 The final intervention was that of ex German Minister for Consumer Protection, Food and Agriculture Renate Künast, who focused on consumer rights: “We are living in the 21st century and we see the results of industrial agriculture of the 20th century – the real question now is what are we doing? Food production should be rights based – and there are two main rights. 1) We have the right to know how our food is produced, and whether the production process harms health or nature. Then we can decide whether to buy it or not to buy certain products. This is a human right in the 21st century. We are part of the economy and we have the right to know. 2) We have the right to safe food without residues, both for the consumer and the farmers working in the fields. These are the rights of the 21st century, if governments are not willing to represent us, we the people will do it on our own”. Link to video. “Over the last century giant agribusiness interests which came out of the war industry have poisoned life, our ecosystems, destroyed our biodiversity and pushed farmers off the land. As these corporations become bigger, they gain more power, more immunity and more rights. The process of holding this poison cartel accountable is the combination of decades of scientific, legal, social and political work by movements, citizens and scientists. The floor was then taken by Percy Schmeiser, a Canadian canola farmer with a personal history of legal disputes against Monsanto. As he recounted: “In the Western part of Canada, we never realized 20 years ago what would happen 20 years later. 1996 was the year GMOs were introduced in Western Canada. I refer mainly to four crops: canola, cotton, soya, and corn. The following economic issues were devastating, in terms of property law, the environmental issue – the mass of chemical introduction! Can you imagine the fear in a farm family when you get an extortion letter from a billion dollar company ? When they give you a letter telling you to send them $500K because they think you’re growing their patented crops. Monsanto would run advertisements in the paper saying if you think your neighbors are growing their crops without a patent contract, report them and we will send you a gift. We stood up to Monsanto, it went to the Supreme Court of Canada after 12 years. The Supreme Court ruled that wherever the Monsanto patented gene is found, the higher life form is also patented. If you were contaminated with a patented gene, whether by wind or pollen fall or however, you no longer own your seeds, they become property of a corporation. How far can this go? What about a human life?”. The final intervention was that of Fernando Cabaleiro, speaker of Nature of Rights Argentina, who recounted his country’s experience at the legal level with Monsanto’s GMOs vis-à-vis intellectual property rights: “Monsanto seeks to declare ‘unconstitutional’ the article in the Argentinian constitution that does not allow plants to be patented. It argues that the insertion of a gene that is inserted into a plant is in fact an invention and thus is patentable. In 2012, the first court granted Monsanto a patent. The argument of the judge, ignoring the opinion of the expert, was that plants and cells can be considered microorganisms. Argentinian law allows microorganisms to be patented. This ruling was appealed by the patent office of Argentina and the decision was repealed. The decision said the judge has disregarded the opinion of the expert and disregarded that plants are microorganisms. The chamber also said the insertion of a transgene into the genome of a plant is not an invention – it is an innovation – but not an invention”. Link to Naturaleza de Dererechos Presentation. Link to video. 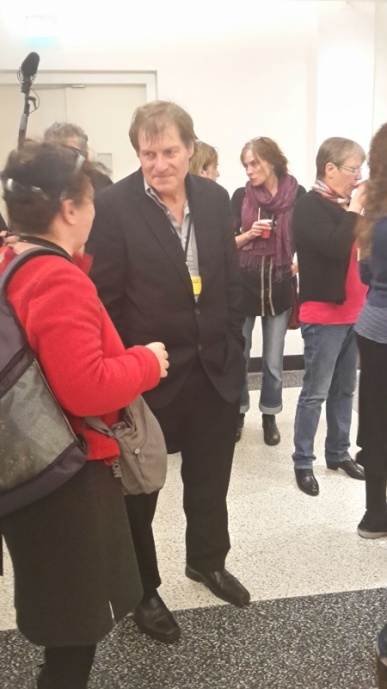 André Leu (President IFOAM International) – Why are they poisoning our children? The floor was then taken by senior research scientist Dr Stephanie Seneff, who stated: “The United States is facing an epidemic in autism, glyphosate likely plays a role. Many of the known features of autism can be explained by the known toxicological mechanisms of glyphosate. Two key factors are manganese deficiency and disrupted proteins due to glyphosate substituting by mistake for essential glycine residues during protein synthesis.” Link to Dr Stephanie Seneff Presentation. The next intervention was that of Brazilian public and environmental health researcher (ABRASCO) Marcelo Firpo, who exposed the current agrotoxics situation in his country: “It is impossible to produce monocultures without destroying biodiversity. The problem is the relationship between agribusinesses and politics. 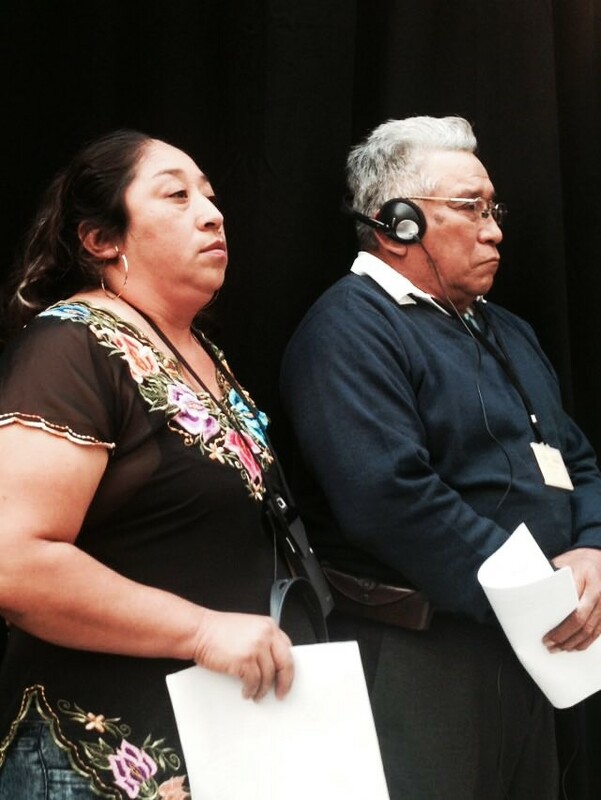 Agribusinesses needs non-democratic regimes in order to be allowed to violate human rights. Health, for example, is not a question of contamination, health is a human right, health is justice, health is the right to our future. I want to underline this because real figures can be 50 time higher than official data on cases of deaths from agro-toxic poisoning. Currently in Brazil many rural areas have an index of cancer higher than in urban bases and the most important factor is the high exposure to agro-toxics. Moreover, Monsanto currently have 5 agro toxics with 3 active ingredients in Brazil that are not allowed in the European Union.” Link to Marcelo Firpo Presentation. Link to Francois Veillerette Presentation. The third talk session was opened by Charito Medina from MASIPAG (Philippines), who explained the dangers of the seed-fertilizer-herbicide package being forced on Philippino farmers: “In the Philippines 700 000 hectares of Gm corn are grown, approx. 25% of corn in the whole nation. In this way 67.1M corporate profit are being extracted from small scale farmers, while the max net income of farmers is 400 dollars. But many end up with negative income because they need to borrow money to buy seeds and chemicals, if you buy the GMO seeds, the seeds will make you buy the herbicides, fertilizer and seeds for the next generation leading to a cycle of impoverishment. Even white corn in the Philippines has been contaminated by GMO corn. Monsanto says let the farmer choose between GMO and non-GMO seeds, both can coexist. However, there is no possibility of coexistence because corn is a natural cross pollinator. The only counter check to multinational corporations is civil society, farmers and consumers. We must fight globally by acting locally.” Link to Charito Medina Presentation. Nnimmo Bassey from the Nigerian Health of Mother Earth Foundation was the next to intervene, illustrating the country’s natural biodiversity vis-à-vis Monsanto’s plans for the development of monocultures and biotechnology in Nigeria: “Nigeria is a nation of 170 million or more people. Our farmers depend on mixed cropping and there is very little monoculture in the country and also very little industrial agriculture. There has been a major push lately through Monsanto not only to introduce monoculture, but to take over the dominant staple crop in the country. So far their development experimentation is failing. They are in the background with some government agencies, which – rather than regulate biosafety – is promoting modern biotechnology. So we have a Biotech organisation regulating biotechnology in Nigeria, which means the system we have is not really any system to regulate anything, but to open up the environment to GMOs. And if Nigeria is overtaken by Monsanto, then you can be sure they have Africa, which is what they are aiming at.” Link to video. The session’s last intervention was carried out by Nivia Silva from MST Brazil and La Via Campesina: “The coup that has occurred in Brazil is a result of the interest of the bourgeois which has led to this new neoliberal government. In this context, production of rice and beans has gone down by 41% and 40% respectively while mass production of soy has skyrocketed. The impact this has had on farmers has been a new form colonization, repression of their economies and a decrease of the production of their basic goods. Moreover, the quantity of agricultural land is also disappearing against this backdrop: 50 years ago, 36% of land was in urban areas and the rest in rural areas, now 85% urban. Huge areas of land expropriated from farmer communities are now cultivated with GMO (44.2M hectares). While, 64% of food in Brazil contains pesticides or fertilizer, in Brazil Monsanto sells 23 agro-chemicals that have banned in the European Union. We want to say that this is no longer acceptable. We no longer want to use agro-chemicals that are trash and not accepted anywhere else. As farmers we have rights, we need to put in to place systems that can stop them because it is no longer acceptable. In conclusion, I believe as international farmers we need to have solidarity among us, while as traditional farmers we need to take back control of our land, our seeds and our businesses.” Link to Nivia Silva Presentation. Link to video. 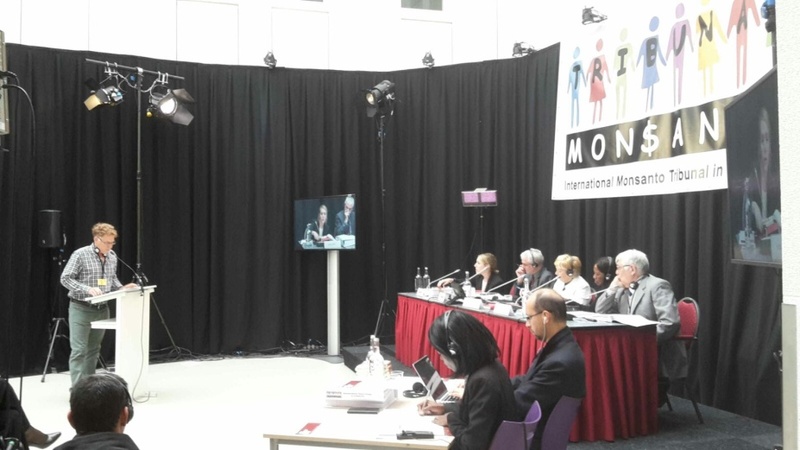 The opening of the fourth session begun with an intervention by British academic researcher Claire Robinson from GMWatch UK, who prompted the question: “What is Monsanto’s role in attacking science and scientists who throw doubt on the safety of Monsanto’s products? The Seralini study was attacked by groups associated with Monsanto; this included a PR firm called V-fluence which is run by Monsanto’s former Chief of Communications, Jay Byrne. This organisation, together with another – which claims to be based on science and is called AGBioWorld – actually conducted a smear campaign against Seralini and his fellow researchers. Some of this smear campaign consisted in having what we call ‘third-party’ academics and third party scientists speaking against the study. This is a known PR technique, and it consists of putting the messages of the corporation into the mouths of supposedly independent scientists and experts because the public trusts those people: it doesn’t trust Monsanto but it will trust a ‘friendly’ scientist. This is how it works and this is what they did in the case of the Seralini study. They put these messages into the mouths of scientists and experts, and also in articles appearing in magazines like Forbes; these were all to smear the study and to discredit the researchers.“ Link to Claire Robinson’s abstract. Link to video – Link to video. 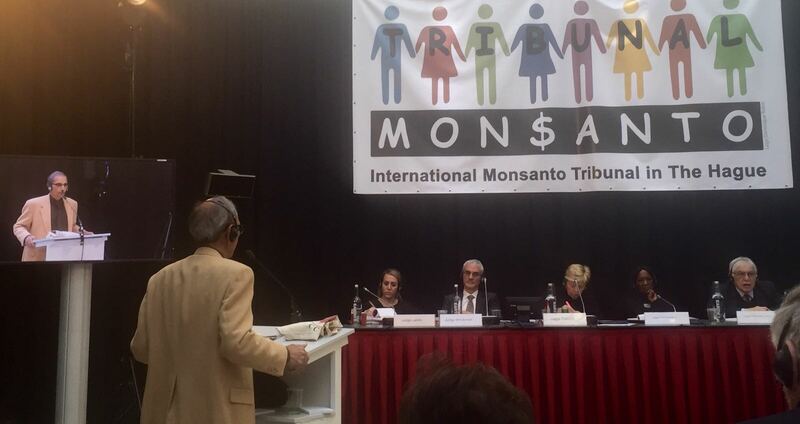 Following in the same line, Canadian microbiologist Shiv Chopra shared his experience of having been discredited by Monsanto for his publications’ findings: “In Canada, Monsanto didn’t even have to lie: they came in from the front door. …Two hundred scientist wrote a joint petition to the Ministry of Health [about vaccines that were officially approved which they deemed dangerous for human health] saying these were wrong and should be stopped. They were completely ignored. So therefore, if I’m going to sue anybody it won’t be Monsanto, or Bayer, or any of these people. It is my own government that has allowed for this to happen for over thirty years!” Link to video. 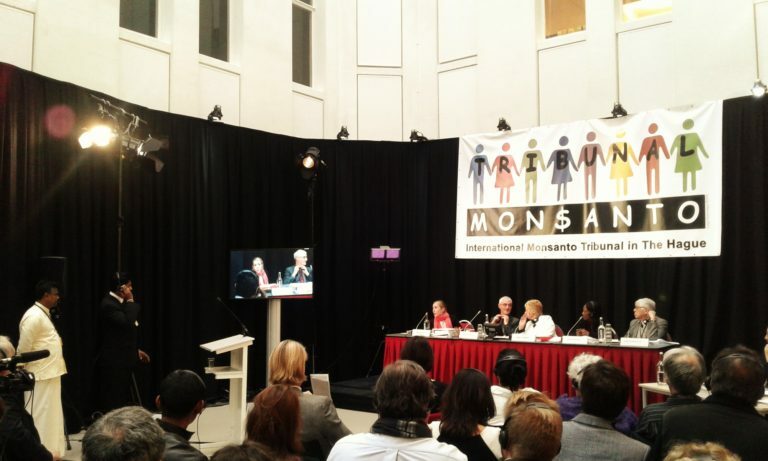 The Hague, 14 October 2016: Millions represented by farmer groups and activists across the globe launched the People’s Assembly and Monsanto Tribunal. Monsanto, along with the other poison making corporations, have to recognise that nature has rights. We cannot continue to allow for violations and looting of our Mother Nature, if we want our planet and all her diverse species to survive. The conquest of nature driven by rampant and mindless industrialization has poisoned and polluted our planet. Greed for the control of nature has driven the new colonizers to disregard indigenous traditions and sciences. In the process, nature has been made into an instrument of exploitation. 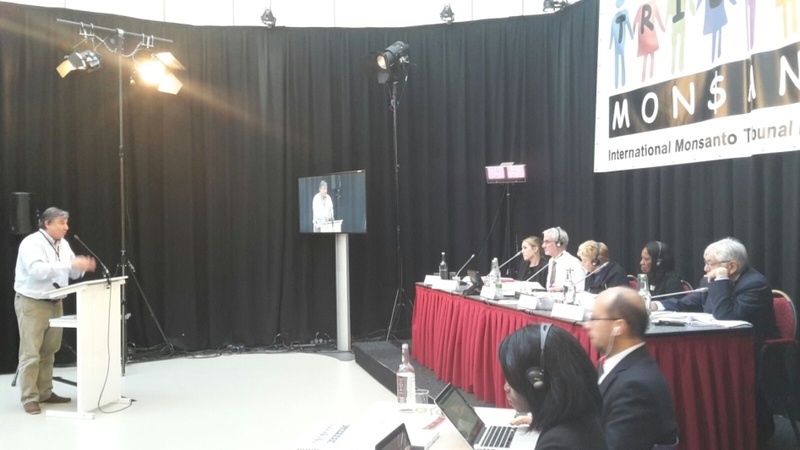 The first session of the Assembly’s second day was opened by Nina Holland of the Corporate Europe Observatory: “It is from this play on words, from the capacity to manipulate language and the essential European principles, from propaganda tactics used to promote free-trade treaties, that we need to protect ourselves: the principle of precaution does not harm a country’s innovation; on the contrary, it promotes the safety of innovation and the freedom of its citizens.” Link to Nina Holland Presentation. According to the latest report from the Transnational Institute (Tni), the free-trade agreement between the European Union and Canada would open the door to 42000 American and affiliated Canadian firms, including agrifood giants such as Coca Cola, McDonald, Cargill and ConAgra foods. In fact, 81% of American firms operating in Europe meet the requirements to be deemed “Canadian investors”. The presence of the Isds/Ics provision within the CETA agreement would therefore allow a large number of American firms to sue national governments in private arbitration courts to demand for compensation, in case of regulations and national laws getting in the way of their interests. The dossier stresses the fact that it’s the multinationals themselves, by now used to using such an instrument aggressively, who have reached the point of inhibiting legislators who, out of fear of being sued, are often prompted not to introduce legislations that might not sit well with powerful multinationals. As such, Ceta would privilege investors by limiting democratically elected governments’ ability to act in their citizens’ interest. The Stop Ttip Italy Campaign organised a protest in front of the Italian Parliament in Rome specifically in order to denounce CETA. The protest saw organic, local Italian pasta prepared on the spot and handed over to participants and passers-by alike in a symbolic act to raise awareness around one of the major risks posed by CETA’s entry into force, that is, the dumping of low-quality primary products on European economies, and the rippling effects on workers in the primary sector. As Monica Di Sisto, the Stop TTIP Italy Campaign spokesperson, explained: “Just like the TTIP, the CETA agreement is potentially dangerous for small and medium production in Italy; it will be even harder for small and medium-scale primary producers, who already suffer from lower prices for wheat and grains, because of the massive amount of low-quality cheap imports from Canada”. In fact, Canada is among the major suppliers of wheat for Italian pasta manufacturing facilities. A matter of price? Of course, but also a matter of quality, considering the fact that Canadian wheat seems to be particularly rich in protein. However, the alleged superiority of Canadian wheat conceals deceitful desiccation practices, whereby this is not obtained naturally, due to adverse climatic conditions in Canada, but through the use of chemical products that could damage human health as well as the environment. “Canada already represents an important partner for the EU” Monica Di Sisto continued “and many Italian pasta manufacturing firms are already buying Canadian wheat as it is rich in protein; what they haven’t told us, though, is that this high protein percentage is obtained by spraying the wheat with tons of chemicals, particularly Monsanto’s RoundUp, whose active ingredient is Glyphosate which is currently forbidden within the European Union. The point being, to sum up, that while it is illegal to use Glyphosate in public parks or even in our own back yard in Italy, we nonetheless ingest it through our pasta every day”. In terms of the Italian economy, CETA will have a huge impact on the primary sector, more specifically on wheat production and consequently on pasta and all its derivative products. As a recent dossier published by the Stop TTIP Campaign states, Italy is Europe’s largest producer of durum wheat for pasta production with 4.8 million tonnes, about 60% of the market request, cultivated on an area of about 1.3 million hectares. However, 4.8 million tons of wheat and 2.3 million tons of durum wheat are imported from abroad. Of these, over half (a total of 1.2 million tons) are imported from Canada. In fact Coldiretti, the main Italian farmer organisation, has declared that almost one out of five packs of pasta contains Canadian wheat. As a consequence, many Italian pasta producers have abandoned the market due to falling wheat prices, despite the quality of their wheat being higher than that of imported wheat flooding the market. The main issue in this context is the fact that wheat has been considered a normal commodity, whose price was to be regulated by the market. However, if CETA were to be approved, 97% of our tariff barriers would be eroded, leading to a process of high deregulation. This agreement would allow North American corporations to take over small and medium Italian enterprises due to the massive imports of foreign wheat and grain it would pave the way for. Consequently, the process of global market deregulation and limitations in storage capacity will exacerbate the war between agroindustry and primary sector producers. According to the Canadian Centre for Policy Alternatives, at least 45% of Canadian food production is exported. National agricultural exports have tripled from $ 11 billion to $ 33 billion between 1988 and 2007. In the same period, according to an analysis by the National Farmers Union, the net income from farms has fallen by more than half, while these companies’ debt has doubled. What’s more, over the last 40 years, Canada has lost 45% of its farms thanks to the free trade agreement signed with the US and Mexico (NAFTA). The total number of farms in Canada plummeted from 366,128 in 1970 to 204,730 in 2011. This data shows the threats posed, especially for our small and medium farmers, by this new ‘wave’ of liberalization. Our safety barriers do not simply concern the economic sphere, but were put in place to safeguard against environmental and health threats as well. The main issue with Canadian wheat regards the high quantity of glyphosate it contains. Not only are North American products treated with glyphosate, which has been banned in Italy as a suspected carcinogenic (the use of glyphosate has been banned in the pre-harvest crops for the sole purpose of optimizing the harvest in the school grounds, parks public, flowerbeds and traffic islands), but also the legally allowed level of toxins in such products is much higher compared to the level that Italian law deems acceptable. Glyphosate, which has been sold by Monsanto as RoundUp, the “miracle herbicide”, has been classified by the World Health Organisation (WHO) as “probably carcinogenic” to the human body. Nevertheless, Canada continues spraying glyphosate in order to increase protein levels in wheat sheaf, but in the meanwhile still leaving high levels of chemical residues. This issue is related to quality levels dictated by the market and industrial sector, due to the fact that it is the latter who define the levels of protein and toxins allowed in our wheat products. Hence the necessity to mix Italian wheat, which has less toxin and more protein, with Canadian grain that has high levels of both, in order to balance the quantities. The pasta issue, however, is only one of many outstanding matters. CETA’s chapter on regulatory co-operation, in fact, would give Canadian agrarian exporters – fifth in the world for GMO production – new instruments to open the European market to their products. However, in most cases these are low-quality products, often cheap imitations of Italian specialties. “Every year, Canadian consumers” the report reads, “buy 3,6 billion dollars in products that seem to them Italian in all respects, despite the fact they are not; the real Italian products in their shopping bags are hardly worth 950 million, yet only a couple dozen pages of the 1.600-page CETA document (attachments included) concern Geographical Indications specifically”. Besides, questions around CETA also concern labour and public services matters. These are issues on which generic agreements have been reached, but that still have not satisfied civil society organisations. One of the matters analysed in the study concerns national governments’ ability to withdraw from agreements on public services without disputes arising with multinational corporations. Public services, under this point of view, tend to be considered potential markets for commercialization: “the agreement’s aim”, the report states, “is that of reversing the current paradigm which, at least in principle, still values the public interest more highly than the private one; with regulatory co-operation and the investments court, the attempt is to overturn such a perspective even from a strictly jurisdictional point of view”. Furthermore, CETA’s chapter on labour is void of binding provisions capable of enforcing respect for ILO (International Labour Organisation) regulations and of any guarantee of keeping multinationals’ privileges and special rights in check. The report stresses that, out of the ILO’s eight fundamental conventions, Canada has not ratified n. 98 on the right to collective bargaining, or n. 138 on the minimum age to be employed as a worker. As Canada, twelve European states have not yet ratified the health and safety-on-the-workplace convention. One of the effects of this situation could be that of enabling those entrepreneurs who intend to move their investments where there are less stringent regulations on labour. According to Monica Di Sisto, CETA represents a treaty whose potential effects on our social and economic fabric would be devastating: “the advantages CETA would grant to multinational corporations are the same ones they would obtain through TTIP; for this reason, we need to raise our guard if we want to defend small and medium-scale local producers”. 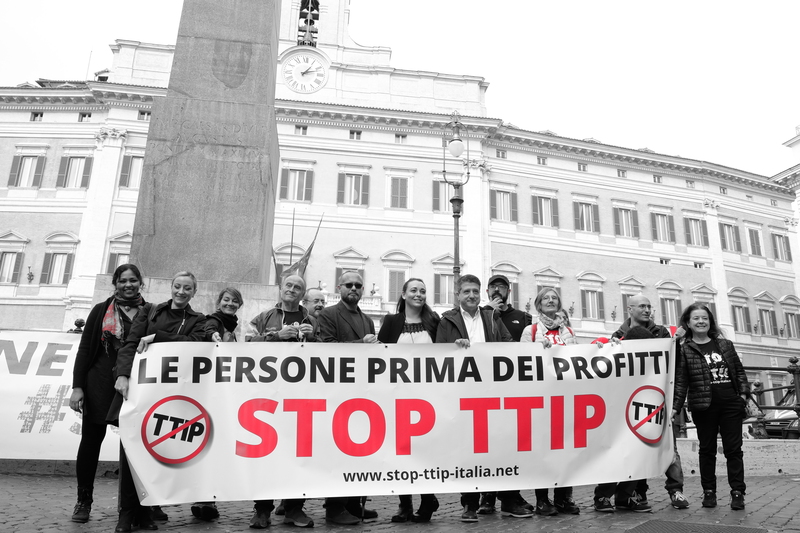 The spokeswoman for the Stop TTIP Italy Campaign concluded “the bad thing is that CETA seems to be completely excluded from the public debate, as was the case with Ttip in previous years, before unions along with consumer and civil society organisations and common citizens started to get informed and to contrast it. I believe” Di Sisto concluded “it is our responsibility to denounce the fact that CETA is actually a ‘Trojan horse’ used to raise multinationals’ profits, and that it is our duty to fight against this agreement from the day of its approval by the European Parliament until its eventual ratification by national parliaments”. The New Corporate Strategies (…) session opened with an intervention by Jim Thomas of the ETC Group: “Genes Drives are the most frightening technology, it means engineering species. There is no place for Gene Drives in conservation. Life it is a self organised organism. We come from a position where there were many food companies and now just few corporations have the control over our seeds, food and planet. Now they are spraying synthetic RNA on crops to interfere with DNA functions. Drones are the latest, they are doing the work for the farmers, this is called vision precision agriculture.” Link to Jim Thomas Presentation. Next up, Antonius Michelmann from Bayer Co-ordination in Germany, stated: “International corporations: democracy of Money. They have billions but we are billions.” Link to Antonius Michelmann Presentation. Chinese academic researcher Xiulin Gu further added: “the Syngenta and Chemchina merger is part of a tripod worldwide strategy of which Monsanto is anyway part of. In China GMOs is a sensitive issue, you can’t say any bad on the media. We have to be united to protect the farm …and to fight against the giants.” Link to Xiulin Gu Presentation. Furthermore, Multi Watch Basel presented the E-book “March against Syngenta: revealing monsanto’ s twin from Switzerland.” Link to Multi Watch Basel Presentation. The power of corporations is not simply limited to the financial market, but indeed their lobbying operations are deeply influencing government policy. Multinational corporations use different techniques to impose their economic interests on democratic governments. Through direct lobbying, PR propaganda and the undermining of independent science, corporations are threatening the freedom of citizens. The power of big business runs contrary to the right of public information. Secrecy is their most important tool to influence and control public policies away from the eyes of the people. Multinational corporations are “hiding” in the European Union corridors where there are more than 30.000 professionals in charge of promoting companies’ aims. Moreover they are also behind scientific research groups such as ISLI in Europe. A large number of academic results are biased as a result of direct corporate financing of research groups as a means of ensuring their business interests. These are some of the ways in which Corporations make their influence felt at the political level. These fraudulent lobbying techniques have been denounced by organisations such as the Corporate Europe Observatory with the aim of promoting transparency and democracy in the decision-making process. 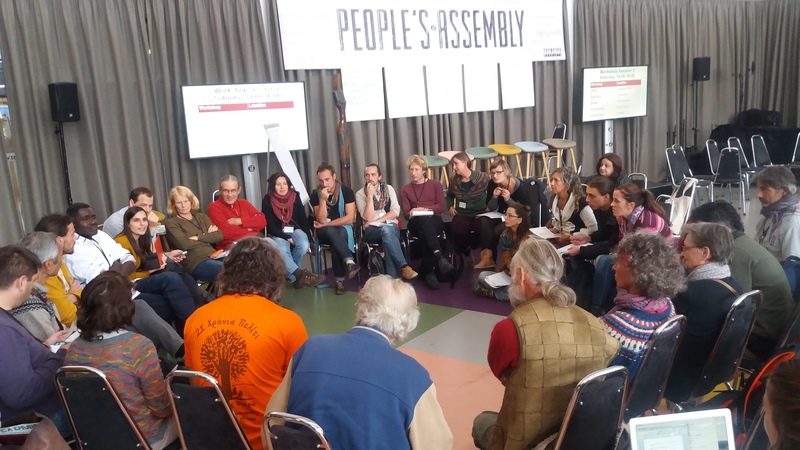 These issues were discussed in depth during the session “Attack on democracy and laws that protect the planet and our food freedom” which took place on the second day of the People’ s Assembly. The intervention by Nina Holland highlights very important issues about the power of lobbies which deeply affect our democracy, environment, food system, and our freedom. Nina Holland works at Corporate Europe Observatory, based in Brussels, it is a research and campaign group working to expose and challenge the privileged access and influence enjoyed by corporations and their lobby groups in EU policy making. Her intervention began by describing three categories of lobbying and strategies in order to understand how these corporations get their way. Direct Lobbying, PR propaganda and targeting – undermining science, are the main techniques that allow corporations to express their economic and political power that threaten our democracy, equity, social justice and the environment. Monsanto is fully representative of corporations with limitless resources in order to fully operate through these different lobbying techniques. Indeed they are represented by lobbying associations at different levels, they are well organised in green-washing projects and they get scientists to act for their business. International trade deals such as TPP, TTIP and CETA are strongly affected by these lobbying activities, where the economic power of these corporations affect the freedom and the rights of the European citizens. COE has worked on these specific cases and they have found that “the agribusiness sector lobbied the European Commission more than anyone else in the run up to the TTIP negotiations. DG Trade actively chased pesticide lobby group ECPA to team up with Croplife America and jointly send a wish list for TTIP. The lobby groups demanded for instance “significant harmonisation” for pesticide residues in food. Trade unions, environmentalists and consumer groups did not receive such special invites”. Moreover, another important aspect of these dangerous trade deals is their secrecy. COE’s report shows that “corporations from all sectors push successfully for even stronger rights to keep information and corporate data secret from the public: ‘trade secrets’. This will seriously endanger the work of journalists, whistle-blowers, unionists, independent researchers and NGOs. New and very similar legal proposals were discussed at the same time in the EU and in the US. Trade secret rules have now been largely harmonised across the Atlantic – TTIP avant la lettre? In Brussels the corporations organised their lobby through the ‘Trade Secrets & Innovation Coalition’, with DuPont as one of its members and working jointly with chemical lobby group CEFIC”. 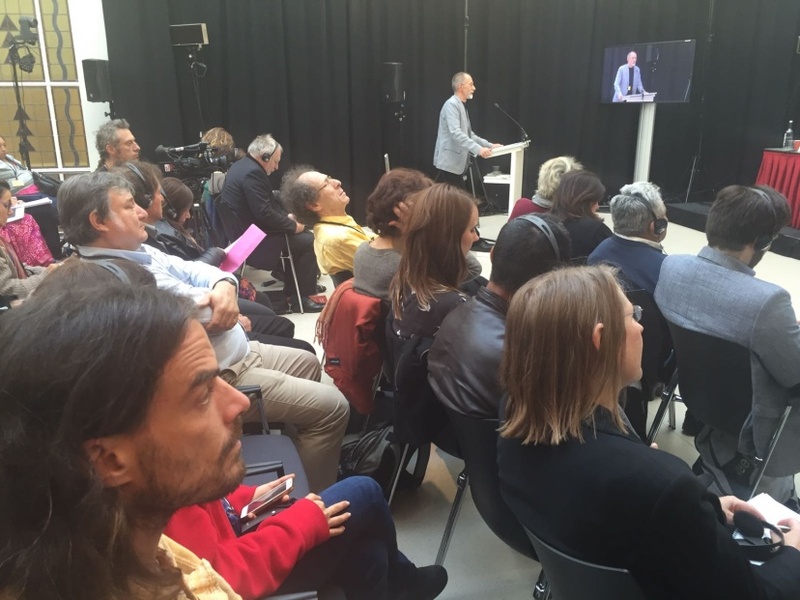 In the context of free trade and free power of the corporations at the political level, what happened last week in the Walloon region represents the possibilities to enforce the citizens rights instead of business. Two Belgian politicians denied the authorization to sign the Comprehensive Economic and Trade Agreement (CETA) between the EU and Canada, stopping another international trade deal that threaten our precautionary principle through lobbying actions and fake innovation. Unfortunately as we have seen in the last days, the action from the Walloon has been under economic pressure and they had “to change their mind”. This specific case is another example of how lobbying operation related to multinational powers are challenging our political freedom and our democracy. There is the necessity to speak out against these actions in order to denounce and condemn these multinational corporations. 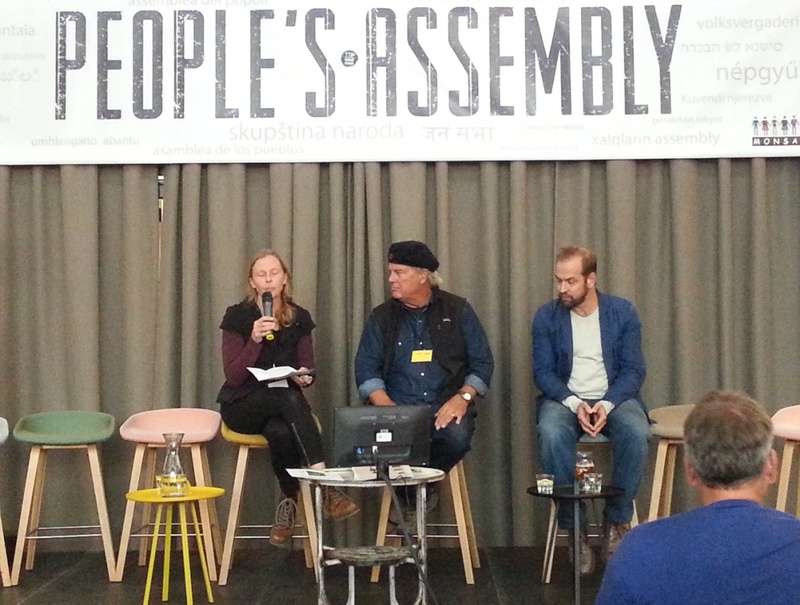 The People’ s Assembly came together in order to be a strong voice against these powers, against the idea that private interests are allowed to take over the public sphere. In order to defend the European integrity and our safety rights we have to be aware of these different lobbying techniques, and unmask what is hiding behind apparently fair political decisions. Over the last century, the word “science” – rooted in Latin: scire (to know) – has had all meaning raided and stripped off it, leaving nothing – zero. The actual pursuit of knowledge has been replaced by silver-spoon-fed-shills parading as “defenders of science”.This “Data”-driven Zero-knowledge is being “hailed” as the solution, to all the very real problems faced by real people around the world. The problems caused by Zero-knowledge, Zero-cience. The Zero-science fraud has been perpetrated by the wealthy elite, to enslave each one of us, and having “admin” control over our economies (dialing in interest rates and exchange rates to adjust prices of everything, everywhere), to dictate who gets fed, and who goes hungry. The entire global economy is merely a giant “Vending Machine” to people. “Yes we can do it, we can change agriculture. There is so much evidence accumulated already to prove that we can nourish up to ten billion and maybe even more people with sustainable agricultural practices”– Hans Herren, President of Biovision and the Millennium Institute. 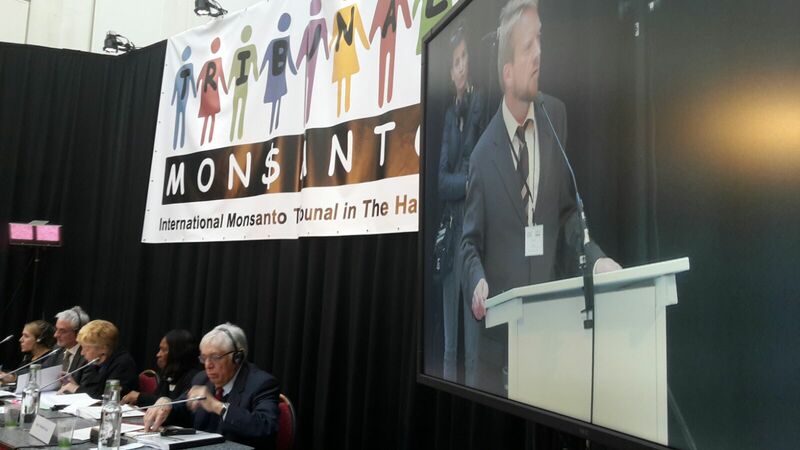 The Assembly’s final day first talk session was opened by Andre Leu, who stressed that: “The greatest tragedy of Monsanto’s model of agriculture is that it is absolutely unnecessary, we could feed two worlds if we wanted to with organic agriculture. We’re now seeing more and more droughts, more and more flooding and climate instability. We need to make agriculture resilient to these types of climatic conditions and organic agriculture is superior in this respect. Organic soil keeps its integrity and absorbs water, while in conventional agriculture the water collapses and erodes the soil. Scientific research has also proven that organic agriculture has higher yields. Reports by UNCTAD and UNEP based on 24 countries in Africa found 116% increase in yield from organic agriculture.” Link to Andre Leu Presentation. Canadian GMO educator and activist Rachel Parent, barely eighteen years old, intervened next, urging: “Nothing to me is worse than the fact that corporations are going to other countries and convincing governments that their crops are the solution. We are all victims of Monsanto’s greed. We all live in democracies and yet we can’t choose what food to put in our bodies. We owe this change to ourselves and the many generations that are to come. It’s not about us it’s about the future”. The Session ended with Bernward Geier introducing his friend who is a baker and made a special bread out of 69 indigenous varieties of wheat dedicated to the People’s Assembly. 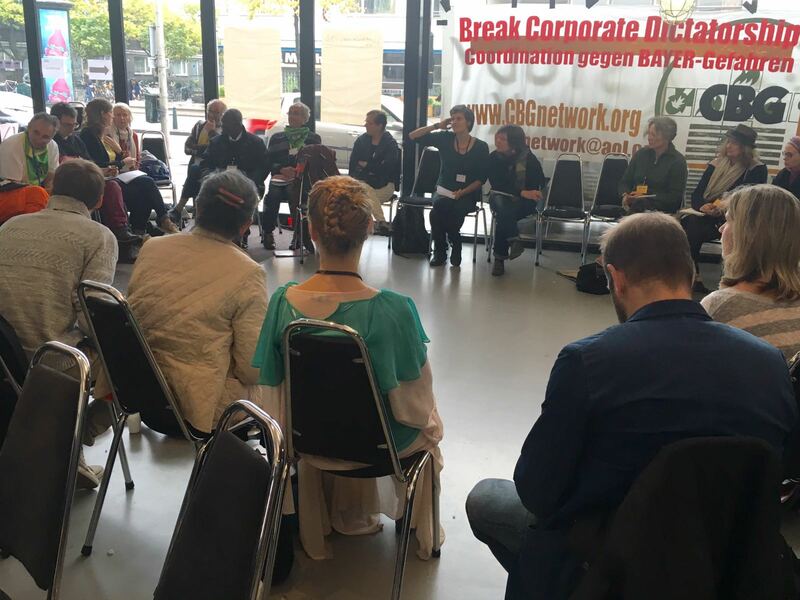 Brennan’s intervention was followed by that of Argentinean Nutrition laureate Miryam Gorban, who pointed to Ecuador as an example of the food sovereignty model to follow: “Today I say that I will die standing but I will not kneel to corporations. We have to choose whether we want food for all or benefits for some. Ecuador was the first country to include food sovereignty in its constitution and that is an example that we should follow” Link to Miryam Gorban Presentation. Link to video. 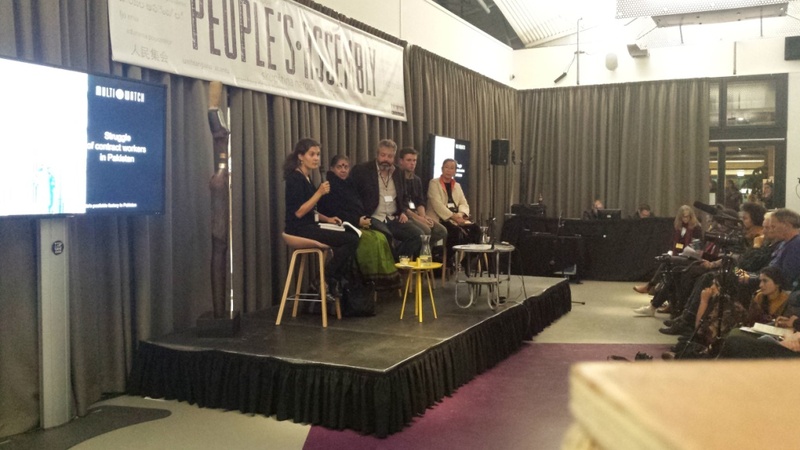 The next intervention – focused on corporate legal accountability and the importance of reaching legal recognition of ecocide – was that of French journalist, UN Earth Rights advisor and End Ecocide spokesperson Valerie Cabanes, who urged: “We have to request rights for nature and rights for future generations. Fossil fuels, nuclear energy, agro-industry and other activities must be banned for the sake of our future. Individual CEOs and heads of states need to be held accountable for their decisions. We need to make it possible for ecocide to be something you can get tried for.” Link to video. Next to speak, Dr Vandana Shiva addressed the public: “Long ago I asked peasants “how do you decide which plant will grow with which plant in mixed farming?”; this 80 year-old peasant in West Bengal said to me: “The plants tell us! The plants speak to us!”. Now, that may seem a bit strange but there was a physicist called Bose in India who wrote the Bose-Einstein theory – with Einstein! He did experiments on plant communication. The way plants repel pests is by sending out communication signals – they have that intelligence! And it’s that intelligence that the stupidity of a violent, crude system of making poisons could never understand. Just as they silenced the voices of people in the concentration camps. They could never hear the voice of the Bee. The bee has spoken, the soils have spoken this morning. And that verdict is clear: there is no place for poisons in our food!”. 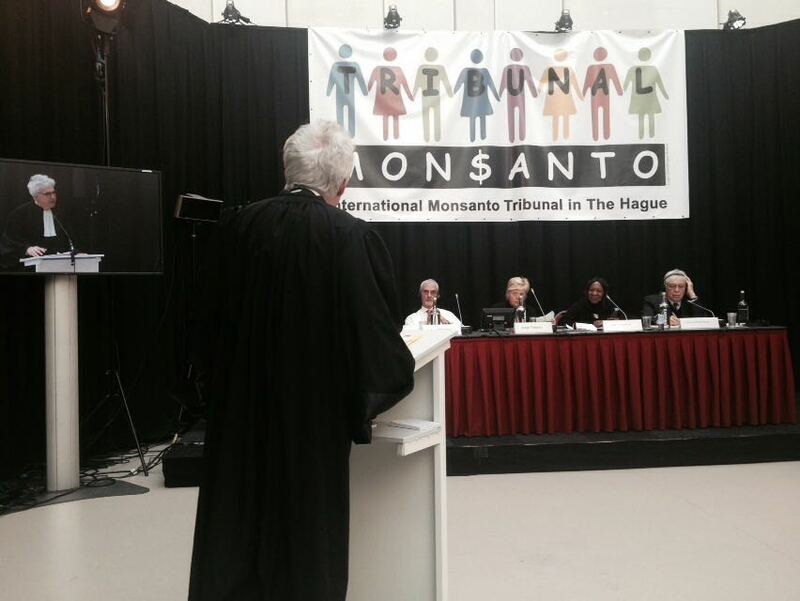 The Hague, 16 October 2016: Monsanto and the Poison Cartel are guilty of crimes against our planet and humanity. 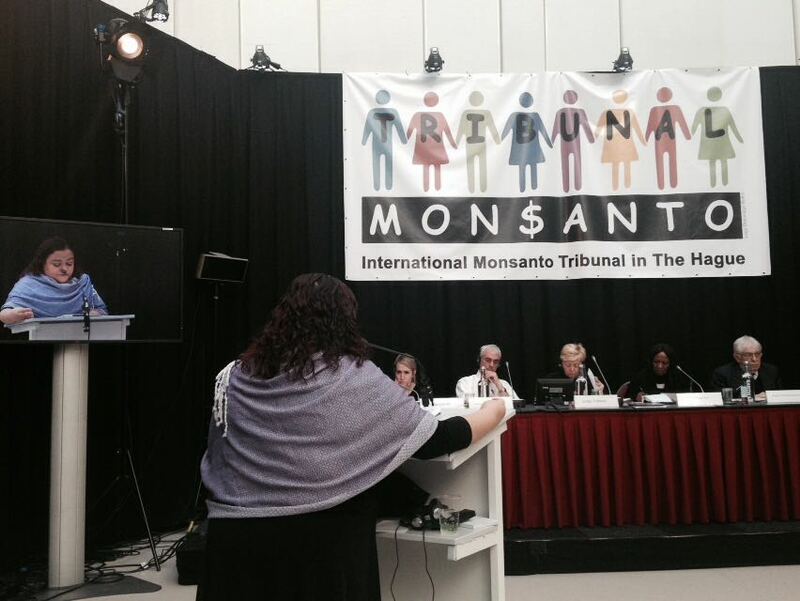 This is the verdict from the People’s Assembly organised in The Hague alongside the Monsanto Tribunal. 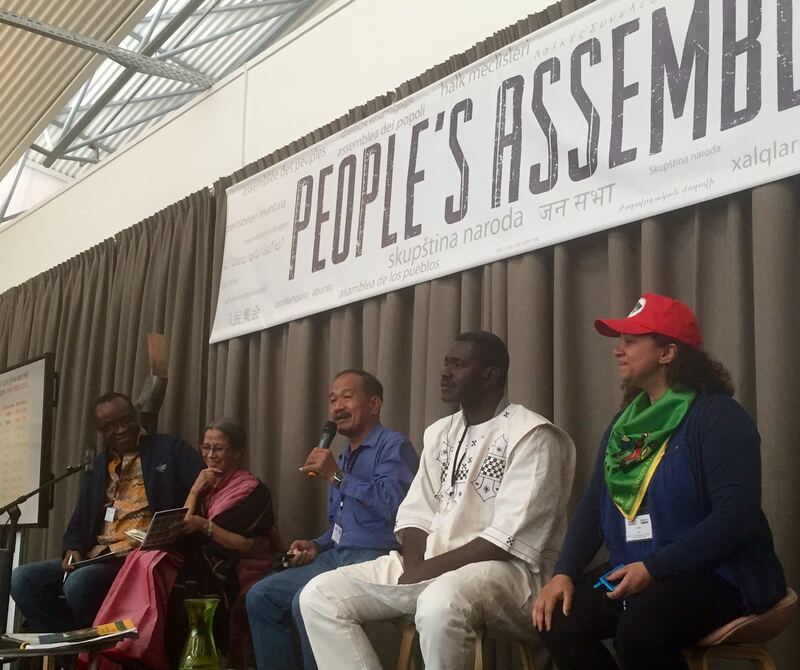 The voices of the soil, of the seeds, of farmers, consumers, and of people from all over world converged and reverberated in a new unity across diversity. The poison making industry is destroying life on Earth, our health and our democracies. 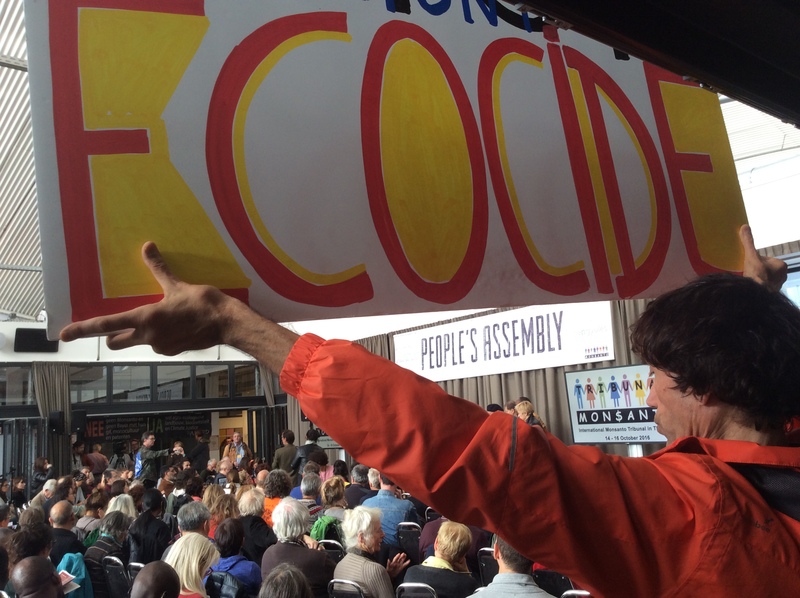 The Peoples assembly resolved to end a century of ecocide and genocide. 2. Crimes against biodiversity of pollinators – 75 % bees have disappeared because of industrial agriculture and have become an endangered species. 3. Crimes against the Soil – Destruction of soil fertility and desertification. 4. Crimes against farmers – With over 300,000 farmers from India along have committed suicide because of Monsanto’s monopoly. 5. Propaganda and Lies: Monsanto have spread pseudo-scientific propaganda and lies to misguide the public and cover up their crimes. 6. Attack on Scientists – They have aggressively attacked independent scientist like Dr Eric Seralini and Dr A Putzai et al who have stood for real science and independent research. 7. Attack on Democracy – Monsanto has repeatedly attacked national governments in India Argentina, Mexico, Brazil, etc. 8. Right to Know: They are taking way from us the right to know what goes in our food. 9. Attack on democratic institution – In countries around the world they have attacked Anti-trust bodies, judiciary and government welfare institutions. 10. Attack on biosafety and Convention on Biological diversity- Monsanto with its genetic contamination and pollution tactics have blatantly transgressed the CBD and all biosafety regulations. 11. Crimes against the Earth/ Gaia – Monsanto and the poisons cartel at the biggest the contributors to Climate change. They are putting us on the path of annihilation. 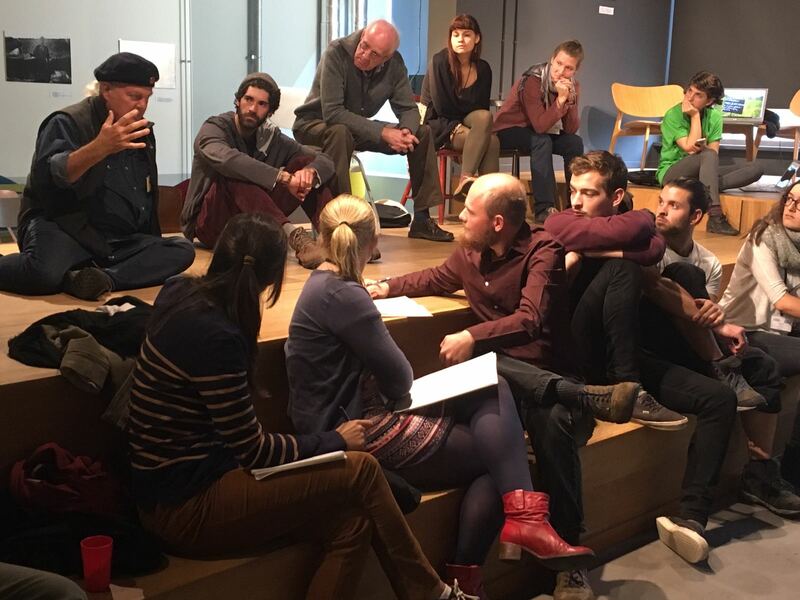 Workshops were divided by 5 subjects in 3 rounds and designed to create as much interaction as possible. Among the participants: Moms Across America, Confédération Paysanne, CCFD members from the Global South, Biowatch South Africa, MADGE Australia, GM Free Australia, UBINIG Bangladesh, Corporate Europe Observatory (CEO), Friends of the Earth Europe, GM Watch, Aktion GEN-Klage, Rencontres Internationales de Résistance aux OGM France/Africa, ETC Group, Faucheurs Volontaires. Among the participants: Ñamoseke Monsanto Paraguay, GM Free Australia, PAN Europe, PAN Italy, Associazione Italiana Esposti Amianto, Naturaleza de Derechos Argentina, Ethecon Foundation, Friends of the Earth, Corporate Europe Observatory (CEO). 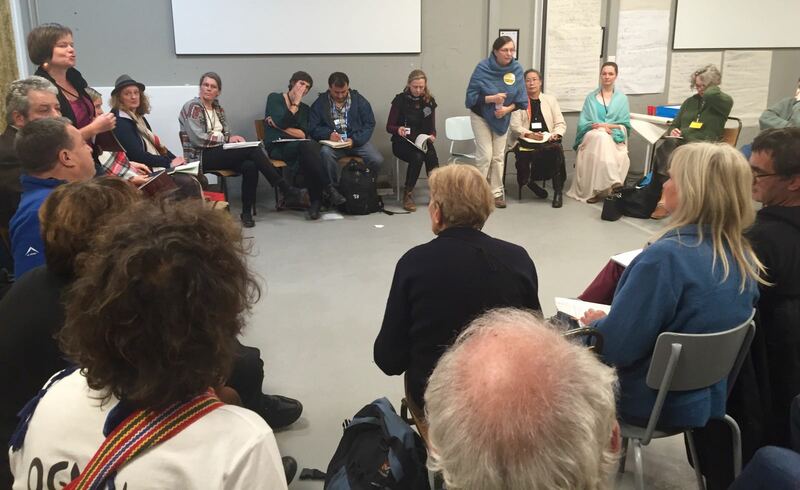 Among the participants: Navdanya, Peliti Greece, UGM/CAPROSET Mali, Autre Terre, Circulos de Sementes & GAIA Portugal, ASEED Europe, Occidental Arts & Ecology Center USA, Frøsamlerne Denmark, No Patents on Seeds, Longo Mai. 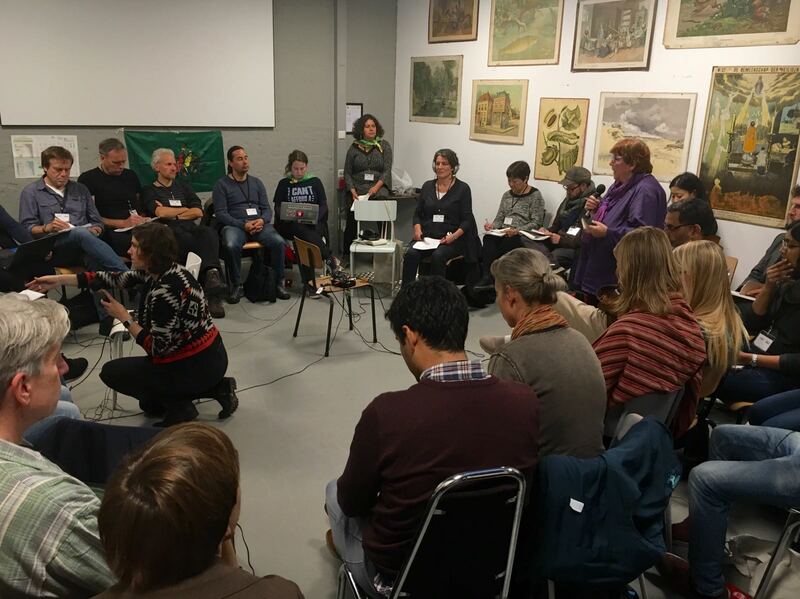 Among the participants: Transnational Institute (TNI), La Via Campesina, Biowatch South Africa, Global Justice Now, FIAN, Friends of the Earth International, Confédération Paysanne, FOEI, Campaign to Reclaim People’s Sovereignty. Among the participants: Navdanya, Autre Terre, CCFD members from the Global South, Regeneration International, Biovision, ILEIA, AgriCultures Network, Save Our Soils, People4Soil, Vandana Shiva, Renate Künast, Bernward Geier. 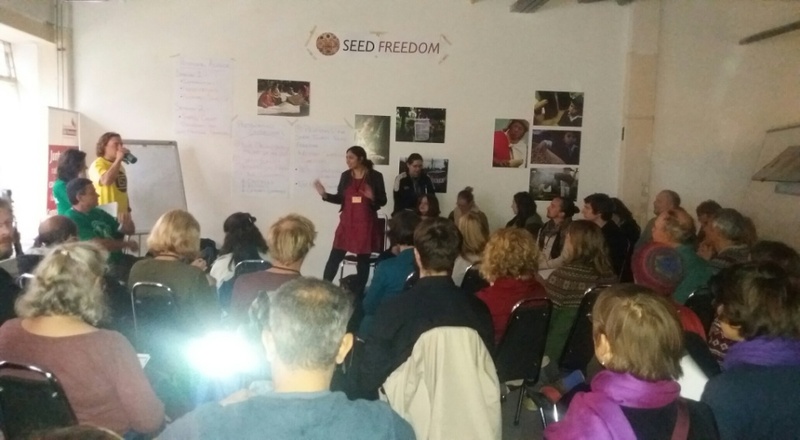 The workshop “Steps towards Seed Freedom” saw the participation of several individuals, groups and organisations from all over the world. During the first session, participants were invited to briefly present their work, talk about the situation with the Seed in their respective countries and make proposals for further discussion. The final seed workshop concluded with another remarkable round of information and strategy sharing. 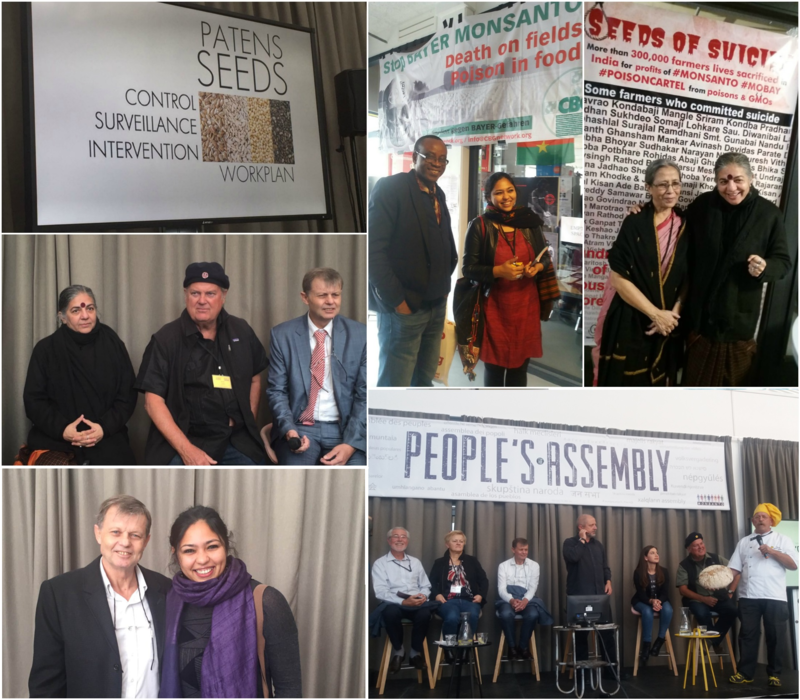 Seed activists from Egypt, Philippines, Germany, Netherlands, Mexico, Columbia, California, Italy, and India took part in the discussion. 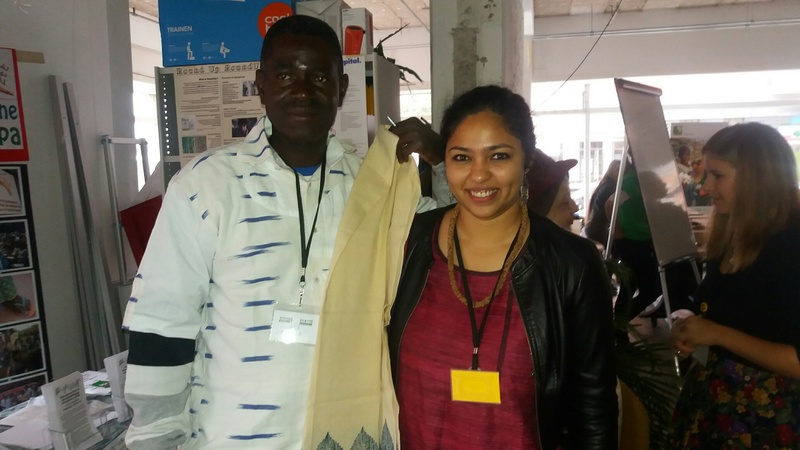 This incredibly diverse group of activists gave detailed descriptions of the unjust seed laws in their respective regions and countries and shared their strategies for resisting these laws. Strategies included non-cooperation with unjust laws by continuing to save, grow, and share indigenous varieties, working through legislative bodies and the courts to allow and incentivize saving, sharing, and selling of locally-adapted, organic, and open-pollinated seed varieties, and organising and lobbying against patent and plant variety protection laws. Link to post, read more. “The Soil Accuses Monsanto” at the International People’s Assembly in The Hague was organised by Navdanya International in collaboration with Save Our Soils and People 4 Soil, and held by Dr. Vandana Shiva, as well as former German Minister for Consumer Protection, Food and Agriculture Renate Künast, and former IFOAM director Bernward Geier. The workshop underlined how soil, essential to the proper functioning of our ecosystem, must be put at the center of our political agenda if we are serious about fighting climate change. 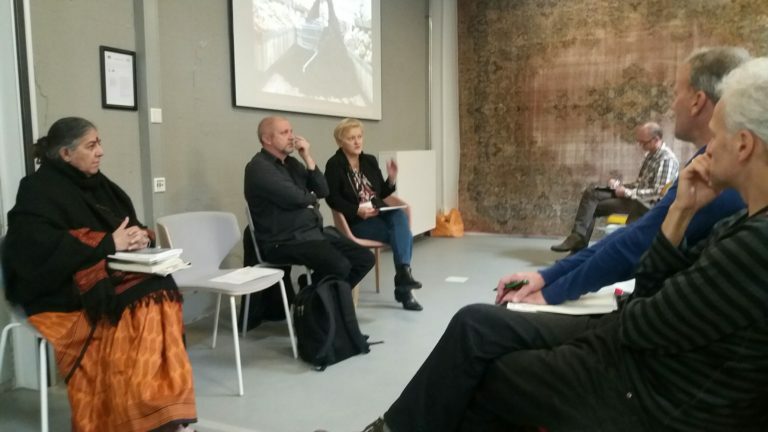 During the workshop, ex German Minister for Consumer Health, Food and Agriculture Renate Künast stated her view that “Preservation of the soil must be on the political agenda – we must tell people it is not just about climate change but also about soil. The new justice question around soil specifically is land grabbing. People must have access to land, water and seeds”. 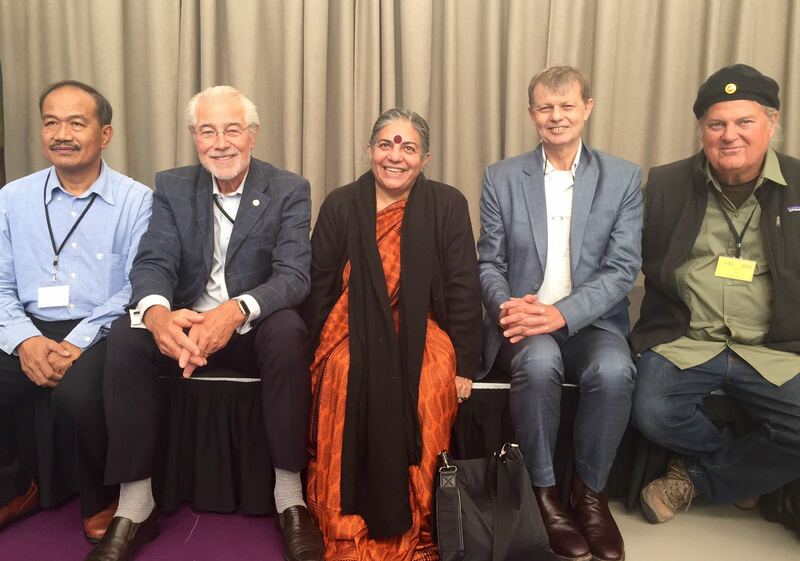 Dr Vandana Shiva followed suit by urging that “We need an economy of permanence based on a model that cares for the soil”. Furthermore, “If we manage to make significant progress in true cost accounting we will beat Monsanto because they completely cheat the system”, concluded Bernward Geier from IFOAM. 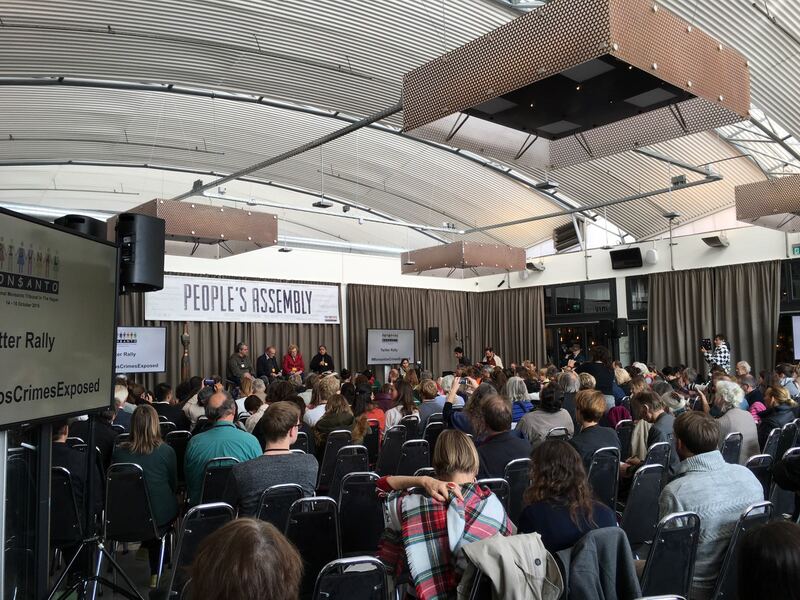 The People’s Assembly kicked off its final day with a series of interactive workshops aimed at identifying challenges and synthesizing key strategies and actions moving forwards. 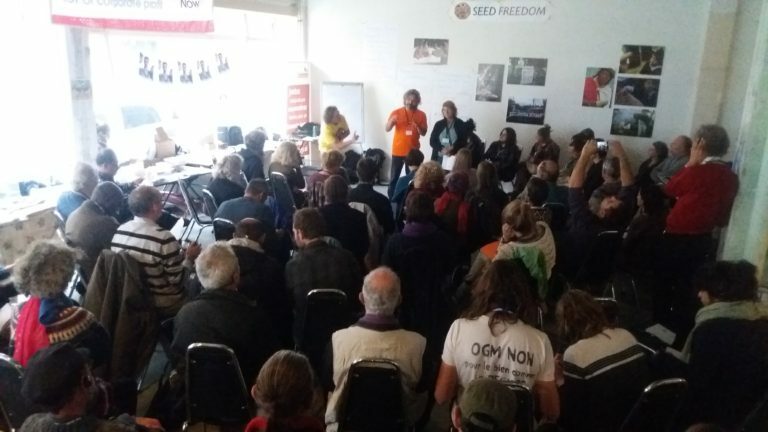 Five different workshops were held, titled “How to ban GMOs worldwide”, “How to ban pesticides and toxic chemicals”, “Steps Towards Seed Freedom”, “Going forward- strategies to build people’s power” and “The Soil accuses Monsanto” respectively. After fruitful discussions in each workshop, groups convened together late morning to summarize and share their main conclusions. 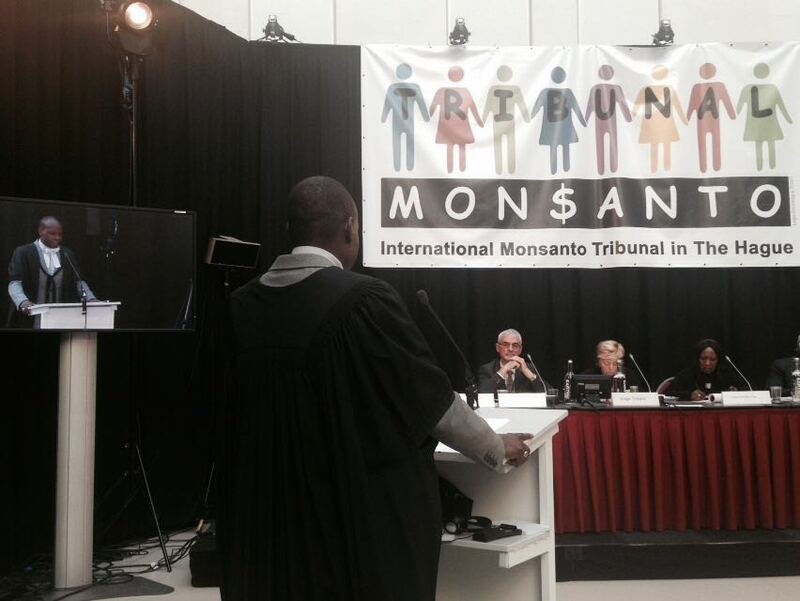 The International Monsanto Tribunal and the People’s Assembly took place in The Hague (NL) between October 14th and 16th 2016. Both events are the result of long-standing collaboration between various international NGOs such as Navdanya, IFOAM, Organic Consumers Association and March Against Monsanto, just to quote a few. Although the two events happened contemporaneously, and shared the common goal of denouncing agro-chemical companies’ crimes (such as Monsanto’s), they however differed in structure and content. Chaired by a selection of eminent international judges and lawyers, the Tribunal dealt with collecting evidence from the testimonies of agro-toxics victims from all around the world in order to redact an “advisory opinion” to be submitted to the attention of the International Criminal Court, in an effort to get the latter to include the crime of “Ecocide” in its official classification of what constitutes crimes against humanity. 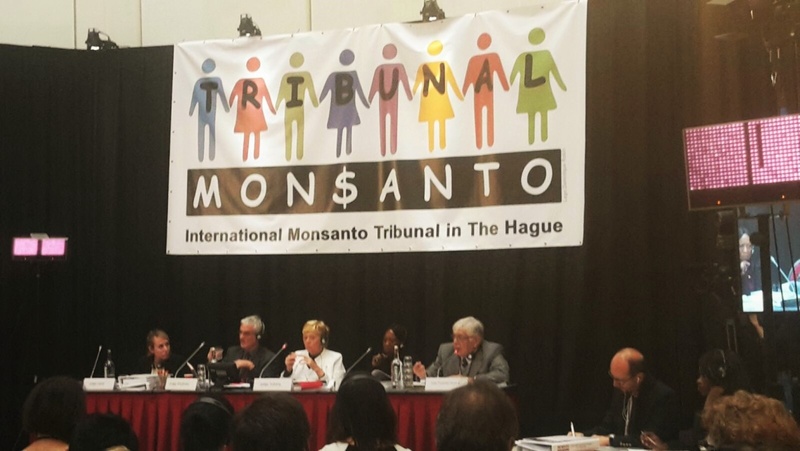 The Monsanto Tribunal’s inception was inspired by the 1966 Russell Tribunal, another civil society “people’s tribunal” with no official legal leverage but which was hugely successful in exposing US war crimes (especially the case of Agent Orange spraying on civilians during the Vietnam War) and in eventually ensuring these were legally pursued. 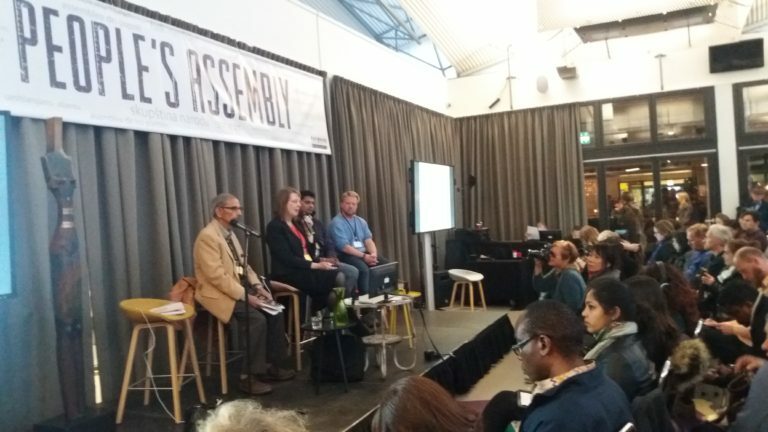 The Assembly, on the other hand, constituted the buzzing epicenter of civil society, as organisations from all over the world had the occasion to give talks and conduct workshops and activities to spread their message. Moreover, such activities were conducted as a collaboration between various NGOs in an effort to come up with a common ‘strategy for action’ to counter the degradation of both the environment and democracy itself resulting from decades spent in pursuit of the agro-industrial model as the main model for development. What both the Tribunal and the Assembly aimed at drawing public attention to is the precautionary principle. Dating back to Hippocrates himself, enshrined in the Rio Declaration (1992) and ratified by the European Commission in the Maastricht Treaty (1993), the precautionary principle is defined as “a policy of cautious conduct regarding political and economic decisions on the management of scientifically contentious matters”. The relevance of this legal principle today is evident respect to the argument against big agro-chemical multinational corporations and the agro-industrial development model these promote (that is, mass monoculture cultivation and the use of agrochemical inputs such as GM seed, not to mention the fertilizer and pesticide without which such varieties could not survive). The precautionary principle’s relevance has returned to the fore precisely for the reason that this development model is widely hailed by governments, scientists and politicians as “progressive”. Much to the same tune, new-generation free-trade treaties such as TTIP and CETA are also exalted by economists and politicians from the highest international institutions under the banner of “progress”, despite the fact that they would harm small and medium-size firms (especially in the primary sector) and would allow for a massive influx of products damaging both the environment and consumer health. Given the above, the NGOs that organised the Assembly and Tribunal wanted these to be a platform through which to prompt a question, not only to the ICC, but to the world as a whole: progress toward what, exactly? During her intervention in the “Campaigns Against Pesticides and Toxic Chemicals” workshop at the People’s Assembly, the president of the Italian association of Asbestos victims (AIEA), Maura Crudeli, reminded the audience: “It has taken nearly one hundred years, since we first found out about its carcinogenicity, for Asbestos to be declared illegal… It is now time for the countdown to begin for pesticides, herbicides and big multinational corporations as well”. Despite awareness about the harmful effects of asbestos, and despite the existence of laws banning its production and its manufacture since 1992, the death toll for asbesto-induced illnesses still remains high in Italy. The point being, as was amply demonstrated by the witnesses’ testimonies at the Tribunal and by the speakers at the Assembly, that there has long been scientific material in circulation substantiating claims about the economic, health and ecological harmfulness of products – for example the seed-herbicide-pesticide package – promoted by the agri-food industry and in particular by companies such as Monsanto. Is allowing poison in our food, in plain knowledge of its dangers, now to be considered “progressive”? And equally: is the promotion of a kind of free trade that would destroy our countries’ biodiversity as well as their economic and democratic stability, also truly “progressive”? How much longer must it take for the pace of the Law to catch up with the pace of Science? The truth is that the real battle at play in this day and age concerns exactly what kind of development model we are to follow, the importance of which is amplified by the urge to deal with the multiple crises of our times (resources/fossil-fuel crisis, environmental crisis, financial crisis and political crisis). Since these are ever-more connected and inter-dependent, it will no longer suffice to tackle them from the national level – for example by signing free-trade agreements or by pursuing “successful, progressive” economic models whose only result is that of progressively embedding our national economies in globalization’s ‘race to the bottom’. 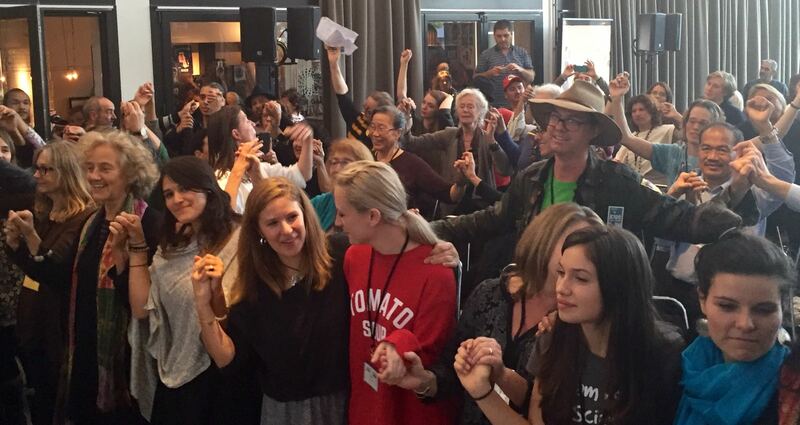 What is needed today is for holistic action to be taken by the world community. This is why the Wallonian case has been so significant in the course of the CETA treaty negotiations: because it has shown that, through the exercise of democracy and civil society, a small group within a nation has been able to defend citizens’ rights by reminding the entire European community of the precautionary principle. This has been the Tribunal and the Assembly’s common goal – to bring the precautionary principle back to the centre of attention, inviting the public to reflect upon which direction we are taking as a planet and to organise in civil society (which is the highest expression of our democratic rights) in order to challenge the common assumption that the products of multinational corporations couldn’t possibly be harmful to consumer health or rights. Because precisely this is civil society’s duty: to keep certain products, treaties, companies or institutions under scrutiny and to hold those responsible accountable for their misdeeds in order to ensure better protection for citizens and a healthy democracy. 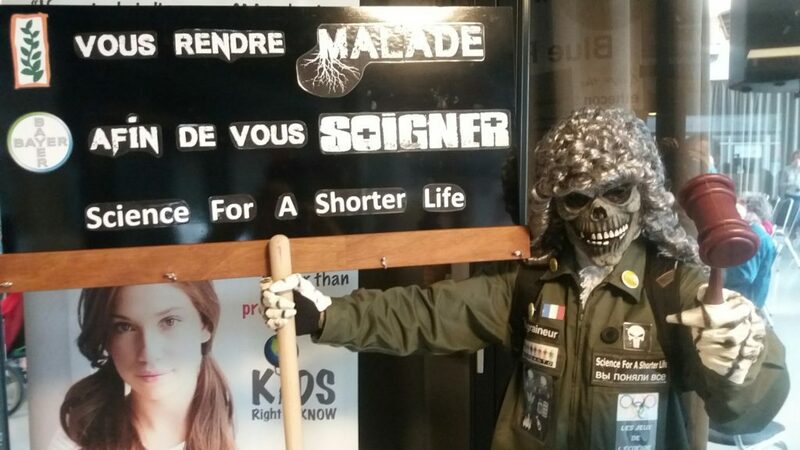 For this reason, despite pessimism from those who argue that Wallonia did not eventually succeed in stopping CETA and that the Monsanto Tribunal was a “masquerade” with a “pre-determined” outcome, both events are to be considered greatly successful. The impact of the Assembly and Tribunal’s message has reverberated throughout Europe and the whole world, judging from the intense political action and mobilization we are currently witnessing. It shows that people from all across the world are taking matters into their own hands by forming their own people’s tribunals to tackle issues in which they feel un- or mis-represented. 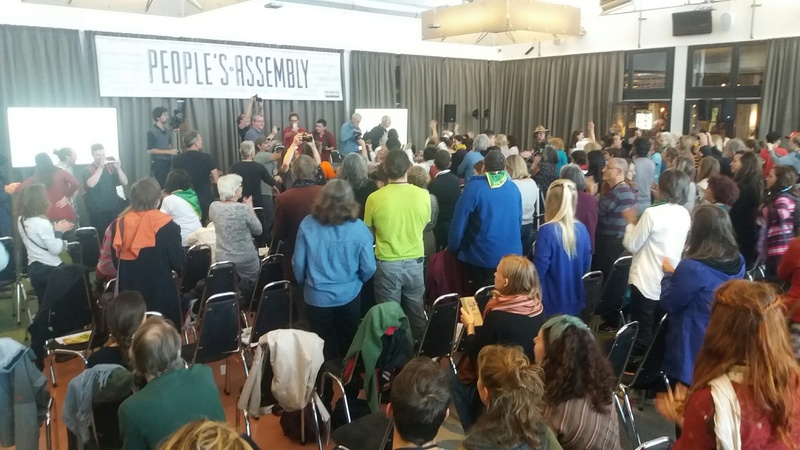 People’s Assemblies and Tribunals will keep on being organised in the future to counter the unbridled capitalist model, uniting citizens under the banner of civil society to protect their rights and those of the environment. 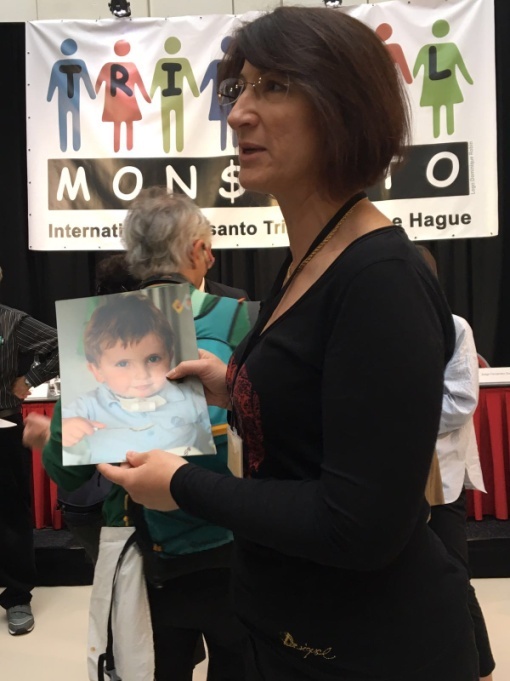 Corinne Lepage, member of the Monsanto Tribunal Organising Commitee, former French Minister for the Environment and Member of the European Parliament. 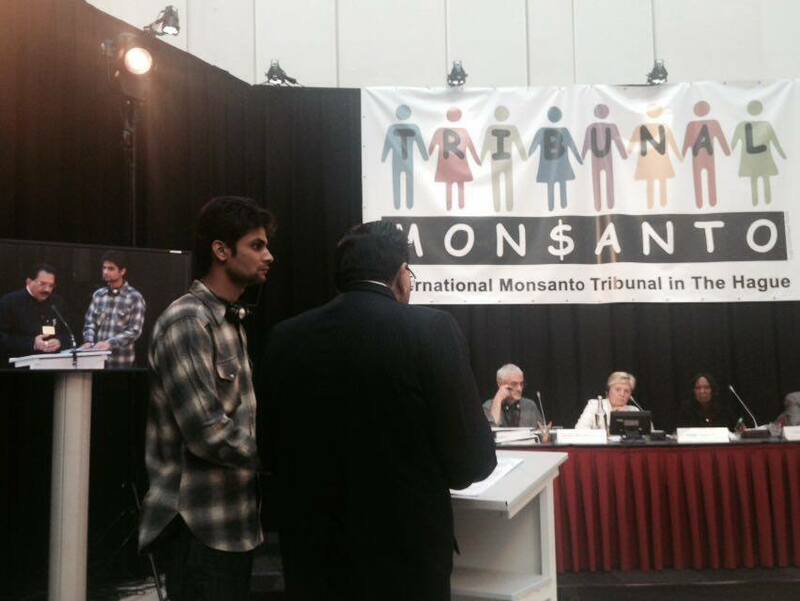 “Our objective is not to condemn Monsanto, but to understand our rights and analyse Monsanto’s behavior. It must allow civil society to be able to effectively fight for their rights based on the scientific, legal and economic evidence”. Jorge Fernández Souza, Mexico, is currently Judge at the Court of Administrative Litigation of Mexico City. He has been: Governmental Delegate of the Federal District within the Miguel Hidalgo Delegation; member of the Council of the Federal District judiciary; Director of the Social Sciences and Humanities division and Chief of the Law department at the Autonomous Metropolitan University Unidad Atzcapotzalco; Guarantor at the Permanent Peoples’ Tribunal, Capítulo México; Adviser of National Arbitrage Commission (CONAI) between the Zapatista Army of National Liberation and the Mexican government; Reporting judge in the Russell Tribunal on repression in Latin America. Eleonora Lamm, Argentina, is the Human rights Director for the Supreme Court of Justice of Mendoza. She holds a PhD in Bioethics and Law, a Master in Bioethics and Law, and a Master in Family Law from the University of Barcelona, Spain, where she teaches bioethics. Member of the Bioethics and Law Observatory of the University of Barcelona and the Centre for Bioethics at the University of Buenos Aires, Eleonora Lamm also has experience as a Researcher at the Consejo Nacional de Investigaciones Científicas y Técnicas (CONICET, Argentina), a Consultant of bioethics and Law at Universitat Oberta de Cataluña and a Director of the Bioethic´s Career at the University of Mendoza. She has been officially appointed by the President of the Argentinean Supreme Court to participate in the commission created by Law Decree 191/2011 to reform and update the Civil and Commercial Code of Argentina. Steven Shrybman, Canada, is a partner in the law firm of Goldblatt Partners LLP and practices international trade and public interest law in Toronto and Ottawa. His litigation and advocacy practice engages a diversity of both national and international law issues including the environment, trade, human rights, democratic process, intellectual property, and health care and other public services. He has written extensively on international trade and investment law, and his work on the relationship between the free trade and the environment was seminal when published in the late 1980s. 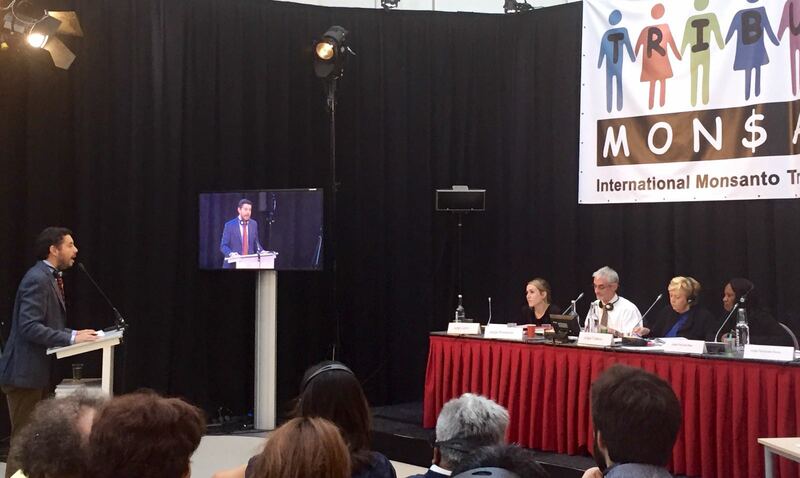 He has represented civil society groups and unions as interveners in several investor-state and WTO trade disputes. Steven Shrybman is currently a member of the Boards of the Council of Canadians, and the Institute for Agriculture and Trade Policy. Françoise Tulkens, Belgium, has a Doctorate in Law, a Master’s degree in Criminology and a higher education teaching certificate (agrégation de l’enseignement supérieur) in Law. She was a Professor at the University of Louvain (Belgium) and has taught, in Belgium and abroad, as a visiting professor at the Universities of Geneva, Leuven, Ottawa, Paris I, Rennes, Strasbourg and Louisiana State University, in the fields of general criminal law, comparative and European criminal law, juvenile justice and human rights protection systems. From November 1998 to September 2012, she was a Judge in the European Court of Human Rights, serving as section president from January 2007 and as vice-president of the court from February 2011. She has been an associate member of the Belgian Royal Academy since 2011. From 2011 to 2015 she chaired the Board of Governors of the King Baudouin Foundation. In September 2012, she was appointed to the United Nations Human Rights Advisory Panel for Kosovo. Since June 2013 she is a member of the Scientific Committee of the European Union Fundamental Rights’ Agency (FRA), of which she is currently the vice-chair. Tulkens is the author of many publications in the areas of human rights and criminal law and also co-author of reference books. Link to video. Her young son Theo who was born with a malformation, he had to be operated on at birth and was on IV for 6 months. Theo had to have 50 operations total, is having his 51st next week. He won’t be able to speak because his vocal cords had to be removed. Every summer she would spray her horseback riding ring with a herbicide with glyphosate that she had seen advertised. Realized one year later that she had sprayed it about 4 weeks into her pregnancy exposing her son in a critical period for embryo development. Since then studies have emerged proving the negative impact of glyphosate on birth Defects. Statistical studies from Argentina found fourfold increase in malformation at birth when only environmental change. Moreover, studies on pigs found that level of glyphosate in their feed heightened the chance of malformation even at very low levels. All these studies led her to conclude that the experience of her son is not an isolated case. Marìa Liz Robledo’s testimony is related with her daughter’s disease, as she was born with a malformation called esophageal atresia with tracheoesophageal fistula, which made the esophagus close. Unfortunately one year after Marìa’s daughter, another baby was born with the same malformation in the same town, Baigorrita. Suspicious about the reason of these rare malformation began to emerge as this happened in the same little town and in less than two years. The only common aspect of these cases is the fact that close to their houses there are agrochemicals containers. “Monsanto still issues no warning, no precautionary statement on the potential dangers … Monsanto has infiltrated very deeply into the regulatory process with many Monsanto execs working at the EPA” Timothy Litzenburg. American farmer Christine Sheppard is one of the witness of the crimes committed by Monsanto. Using Roundup on her coffee farm in Hawaii since approximately 1995, she was forced to sell her farm and move to California in order to get appropriate treatments due to that fact that in 2003 Sheppard was diagnosed with non-Hodgkin’s lymphoma. One specific form of cancer – NHL which has been linked with the exposure of glyphosate by two Swedish oncologist Dr. Leonard Hardell and Dr. Mikael Eriksson. Sheppard accused the multinational agribusiness of falsely masking the carcinogenic risk of glyphosate and is responsible for causing the woman’s cancer. Plaintiff’s lawyer, Timothy Litzenburg, who will also attend the Tribunal, is defending Sheppard in the case Christine Sheppard v. Monsanto Company, case number 2:15-cv- 08632, in the U.S. District Court for the Central District of California. Sri Lanka represents an important example in the fight against Monsanto’s crimes. As a farmer and ex health minister, in 20015 President Maithripala Sirisena banned glyphosate import in the country. The decision was made due to the rising rates of chronic kidney disease (CKD) throughout the Sri Lankan farming community. CKD already affected 15% of people working in the northern part of Sri Lanka, around 400,000 patients, directly related to Monsanto’s chemicals. Link to video – Link to video. Marcelo Firpo Porto has studied the impact of agrochemicals on human health in Brazil, due to the fact that the country is the largest consumer of agrotoxics in the world. Between 2000 and 2012 there has been an increase up to 162% in the volume of pesticides such as glyphosate, due to the release of GM soybeans by the Brazilian government. From his research emerged that between 2007 and 2011 there was an increase up to 67.4% of new non-fatal labor accidents due to pesticides, and the coefficient of intoxications had an overall increase of 126.8%, and was even higher among women (178%). Between 1999 and 2009 the number of acute poisoning was about 62 thousand. 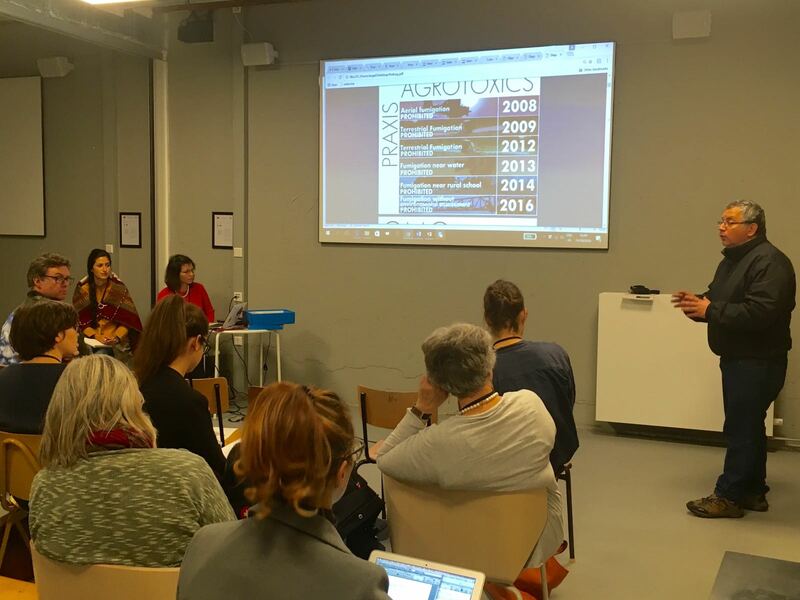 In 2011 it was launched the Permanent Campaign and For Life, an alliance with social movements and civil society organisations. Currently the Campaign brings together more than one hundred social organisations, including ABRASCO. The Campaign has been developing communications, training, and political connection actions, disclosing the problem and expanding the discussions about the impacts of pesticide contamination in Brazil. “Soy beans introduced 40 years ago along with massive spraying of glyphosate, 1 liter per hectare, have radically changed Argentinian landscape. Agencies in Argentina are responsible for counseling farmers and strongly advocate for agro-Chemicals. They told him lie verbatim “Glyphosate when it hits the soil becomes inactive and leads to no damage at all” (…) It was a big mistake to give up our traditional methods. There are no more animals in our countryside and the fertility of our soil has been compromised”. In 1996, Argentina’s agricultural system was deeply and dramatically affected by the introduction of genetically modified plants such as soy, corn and cotton. Looking at one specific case the consequences of growing RoundUp Ready soya include a massive exodus from the countryside as small farmers found they could no longer make a living or were driven off their land. The use of agrochemicals and chemical fertilisers has increased and the aerial spraying of herbicides that has led to ecological contamination. Furthermore, the use of intensive monocultures has lead to an acceleration of deforestation. 1.Despite what the media and so-called “experts” proclaim, there are NO peer-reviewed scientific papers establishing the safety of GMO crops. indeed, no one has been able to establish that there’s a safety factor to either the genetically engineered proteins (i.e. the foreign proteins produced by the genetically modified plant) or the chemicals we’re consuming in ever larger quantities as a result of the genetic engineering process. 2.Epidemiological patterns show there’s an identical rise in over 30 human diseases correlated with our increased usage of glyphosate and the increased prevalence of genetically engineered proteins in our food. 3.Genetically engineered foods, as well as conventional crops that are heavily sprayed with glyphosate (the active ingredient in Monsanto’s herbicide Roundup), have lower nutrient density than organic foods. They also contain high amounts of pesticides with documented harmful health effects, along with novel, highly allergenic, proteins. Looking at the impact on animal health, Art Dunham spoke about eight different issues related to the use of herbicide. An increase in manganese deficiencies due to feed from Roundup Ready corn and soy. This deficiency can lead to stillborn deaths and calf health issues in dairy cows and viral diseases in hogs, such as porcine reproductive and respiratory syndrome (PRRS) and porcine circovirus (PCV). Furthermore, poor immune system and deformities in caves. Furthermore his studies show Cobalt deficiency and weak spine due to vitamin B12 deficiency. Others diseases such as visceral botulism have been revealed with also an increase in listeriosis, fusarium mycotoxins in feed, and early term pregnancy loss. The Danish farmer reported his specific experience on his pork farm. Mexico represents another South American country fighting against Monsanto, especially for its impact on honey, produced by indigenous communities. Unfortunately, Mexico’s initial ban of GMO corn in September 2013 was overturned in August 2015, which opened the door for more business opportunities for Monsanto. “Our country is the third largest export country of honey; 15000 Mayan families live from bee keeping. The fact that Monsanto was allowed to sell GM soy and that it can be cultivated led the quality of our honey to decrease, and affected our market as the EU won’t buy our honey if levels of GM contamination is too high. In 2015 soy was used by private countries in Mexico for the first time with the goal to strengthen farming. We see this as an infraction on human life. We are a witness of massive human death, we see the environment starving, the production of honey decreasing and we are suffering because we depend on honey production. Other plants are also affected, due to monoculture 18 000 hectares have been deforested. Biodiversity has been reduced drastically as a result, affecting tourism as well as Mayan communities, due to the fact that there is no clean water, no clean soil. Contaminated water due to residue of glyphosate confirmed by doctor has caused health issues such a kidney infection”. “In 2014 the two previous speakers filed lawsuit against Monsanto which eventually went to highest court of Mexico which confirmed that the rights of indigenous people had been violated limiting Monsanto from using glyphosate. However there was no compensation for farmers, Mexican courts never considered the social, political and economic costs. A petition from human rights committee that compensation needs to be paid. We are going to file a lawsuit against the constitution against the air fumigation that went on in that region. He started to notice negative effects of agro toxics which were leading to resistance, so he turned to organic agriculture. In 2004-05 he had the first positive impacts of having switched to organic agriculture which lasted until 2008 when he started to notice traces of GM in his crops, which became a huge issue for selling his organic products. Trials demonstrated that GM canola could not be contained but the government still approved it for released in 2009. His neighbor started growing GM Canola, he attempted to take precautionary measures to prevent contamination. Despite warning neighbor, he lost approximately 70% of crops as a result of contamination. Eventually he filed litigation he went to trial, but the court ruled that his neighbour was not negligent. Steve Marsh lost, and the trial cost him 130000 (AUD) personally. At the same time, all kinds of correspondence going between Monsanto and the government. Ousmane Tiendrebogo, farmer Burkina Faso. Africa’s biggest cotton grower, Burkina Faso is another winner in the fight against Monsanto. In the early 2016 the government banned Monsanto’ s business in the country. The country is now phasing out Monsanto’s GM cotton and returning to indigenous varieties by 2018, due to concerns of cross-contamination of local crops and the less-than-stellar performance of Monsanto’s BT cotton. Monsanto Bt cotton’ s promises, as a miracle for huge farmers’ profits, have enormously failed as yield are deeply falling while the amount of pesticides and fertilisers are enormously increasing. Looking at the Indian case, through the collection of royalties Monsanto has overtaken Indian law and has created a seed monopoly in the country. The impressive wave of farmers’ suicides occurring in the Indian Cotton belt in the last decades is due to the fact that this monopoly has had a huge impact on the increase of seeds price, leading farmers in debt and with no profit from their harvest. “300 000 suicides due to Bt Cotton leaving their families homeless, landless and with no compensation. The price of 1 kg of cotton seeds use to be 5-7 rupees, after Monsanto’ s arrival it increased by 70 000%. Monsanto corrupted the government through bribes, 95% of cotton in India is Bt cotton. Furthermore India is currently debating about the introduction of GM mustard, this means that Monsanto is trying to have a monopoly on food as well as seeds. Colombian and US government used aerial spraying of glyphosate in order to fight cocaine war without taking in account the health and environmental risks of these pesticides. Paraguayan President Federico Franco took over the preliminary safety studies required by law from environment and health ministries, in order to introduce Monsanto’s GM cotton in the country. At that time the former head of Paraguay’s National Service for Plants and Seeds Quality and Health (SENAVE), Miguel Lovera, had refused to approve GM cotton. Unfortunately in order to solve this issue between agricultural- environmental regulation and interests of multinational corporations-GM lobby, Miguel Lovera was substituted with a president of an agrochemical company. “We were lied to about the toxic effects of the toxins. It is depressing especially after the other reports I hear here. We present these long-term effects that damage many future generations, there are lapse of times between applications and the first signs of damage, to report accurately and prove that there is a link. Monsanto obviously succeed in persuading our health companies that a chemical product is not harmful and it can be used on a daily basis. Huge mistake for public health. The agro-toxins were to be certified and licensed, and we wanted to show that they are negative, we wanted to assess the environmental damage, but that’s playing with fire. Thirty years ago Professor Seralini began his career trying to know what are the pollutants in babies’ genes, and he saw that three of the major pollutants belong to Monsanto. At the time, he had nothing against them. But he saw that the PCBs, which are from the plasticiser family, and derivatives of petroleum residues, dioxins (also derivatives of petroleum), and pesticides (including Agent Orange or RoundUp, which is the world’s main pesticide) were there. And what he did was try to find a mechanism by which they could give chronic diseases, and because in fact every family in the world is ridden by chronic diseases and people are suffering all over the world because of them. Seralini’s studies showed that these diseases are not due to bacteria or viruses, and not due to a genetic ‘shift’ in humanity, no. We have more and more pesticides inside ourselves. There is no human organ, no brain, no mammary gland that is devoid of pesticides from these big companies. 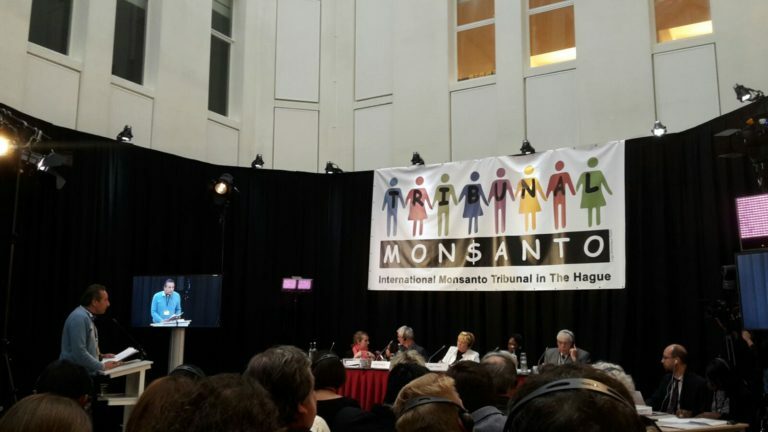 Instead of Professor Seralini, who could not attend the Monsanto Tribunal, his collaborator Nicholas Defarge represent their scientific work in front or the Judges. 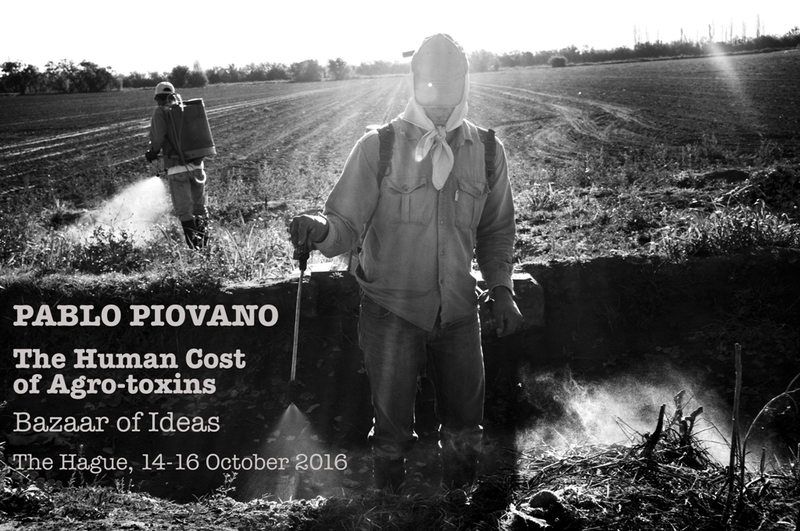 Also read: A matter of fraud: hidden poisons in pesticides (Message of Prof Séralini to the Monsanto Tribunal and People’s Assembly). Dr. Chopra is another scientific name that has been fighting for global food security in the scientific level. Indeed he refused to approve various harmful drugs for food-producing animals when he was employed as a senior scientific advisor at the Canadian ministry of health. He endured disciplinary actions, spoke out publicly, testified at Senate committees, and won many federal court cases against the Government of Canada. “Hormones, antibiotics, slaughter house waste being fed back to animals, glyphosate, all these products are illegally approved. So when we come here blaming Monsanto we have to recognise that the USDA employee is a Monsanto official, recommended by the President of the US. Suspended and gagged, I cannot speak anywhere. I cannot go anywhere, so where am I living? This is Canada. The federal fueled in my favour, but now I’ve blown the whistle, now it’s my obligation to go public. “I never said my behavior was going to change, I published a book “Corrupt to the Core”, I am a whistleblower, I am a government official, I have the protection of the law. On page 154 there is Monsanto’s manifesto announced in 1990 that they are going to take over the world, and they have the White House. On page 214 you have a title saying “Bayer Beware” it was Bayer’s antibiotic that I refused to approve. “A proper evaluation of the available evidence contained in the authorities’ own documents inevitably lead to the conclusion that glyphosate is carcinogenic in experimental animals warranting a category 1B carcinogenicity labeling of glyphosate. Distorting various facts, ignoring existing knowledge and denying available evidence has to be considered as an attempt of the authorities to allow the chemical industry to continue the marketing of a carcinogenic herbicide”. “While individual rights must be defended, we also have to look at collective rights. Three important collective rights are the collective right to a healthy environment, healthy food, and a healthy human life. UN principles along with countless international declarations, conventions, and protocols proclaim the right to a healthy environment. These instruments affirm that companies must protect human and environmental rights, mitigate negative consequences, and make sure their services and operations do not harm these rights. These international instruments also give the right to victims for compensation in case of damage. These rights need to be respected and actualised. Companies like Monsanto publish documents stating that they will protect human rights and the environment, but this is just a signature on a piece of paper – they need to show that they are actively working for these principles. For evaluating whether companies have succeeded or not in following these principles, they cannot just have consultations with the experts. They also have to listen to victim’s personal experience. Listening to victims about whether companies have respected their rights has never happened in the case of Monsanto. Importantly, we must use the precautionary principle. To protect the environment and health, we must avoid the damage, not feel bad about a decision taken 50 years ago. This is especially true if there isn’t peer reviewed and fair scientific evidence. Often, it is not clear what the effects of these products are on human and environmental health. As long as we do not know the effects, we can say the environment is going to remain healthy and clean. We are living in a system that gives companies a lot of power. According to international organisations, 70% of food is provided by small farmers. Healthy food depends on small farmers. They are who we should be supporting. Unfortunately, these small farmers suffer most from this industrial corporate system. They are forced to use a system that makes them even poorer and gives them less power. “Thousands of individuals have been handed death sentences by Monsanto in one way or another. Monsanto’s consciousness stops and starts on the stock trading floor. They see people as numbers. Money can buy a lot of things but not a consciousness. Playing God with the environment has made us pay dearly. Mother nature doesn’t play games, she cannot be contained. If we are not willing to change, we will be removed from the globe and replaced by insects. Is Monsanto complicit in a war crime by providing materials for the US Army by Operation Ranchhand in Vietnam. The goal of this operation was to de-foliate the country to make military operations easier. In November 1961, Kennedy approved the use of herbicides in the Vietnam war for Operation Ranchhand, which was conducted until 1971. During this operation, the US Air Force used specially modified planes to spray the herbicide Agent Orange. Monsanto was the dominant supplier out of nine other companies who manufactured herbicides for Operation Ranchhand. Monsanto has collected the bulk of the profits from Agent Orange which was multiple times the toxicity of the other herbicides offered by the other companies. During operation Ranchhand, 19 million gallons of chemicals sprayed on 20% of Vietnamese jungles and 36% of mangroves. Scientific studies have shown a connection between Agent Orange and many diseases and birth defects in children. As early as 1675, the use of poison in any manner was declared to be excluded from modern warfare – that it was outside the law and usages of war. This tradition continues today with the Declarations of The Hague. 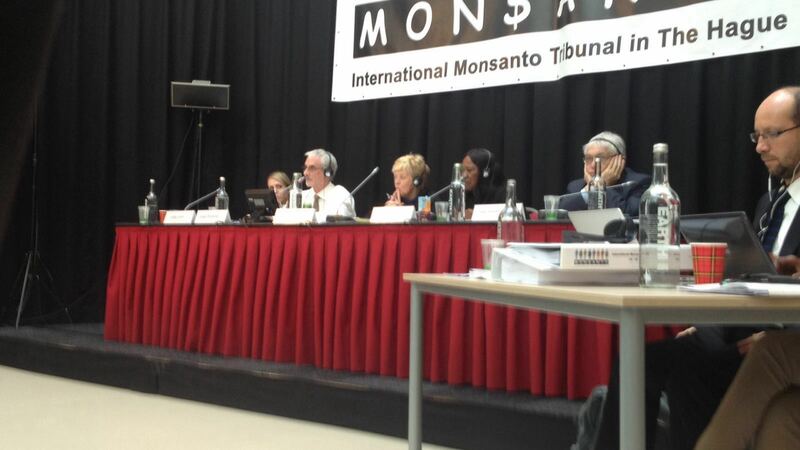 After having heard the witnesses’ testimonies over the two days of the international Monsanto Tribunal, the judges are now in the process of deliberating amongst each other in order to issue an “advisory opinion”. As to the main six questions relating to the rights recognised by international law (the right to food, the right to a better state of health, and the right to the freedom that is indispensable for scientific research), these rights are notably enshrined in the International Covenant on Economic, Social and Cultural Rights, as well as the Convention on the Rights of the Child and the International Convention on the Elimination of All Forms of Discrimination Against Women. Other international instruments also exist, such as the UN Principles and Guidelines on Business and Human Rights, as approved by the Council of Human Rights in a resolution from June 2011. The judges are not pronouncing judgment: rather, they will give an advisory opinion. Specifically, they will verify whether Monsanto’s activities are in compliance with the laws as they exist in the UN, along with other legal instruments. 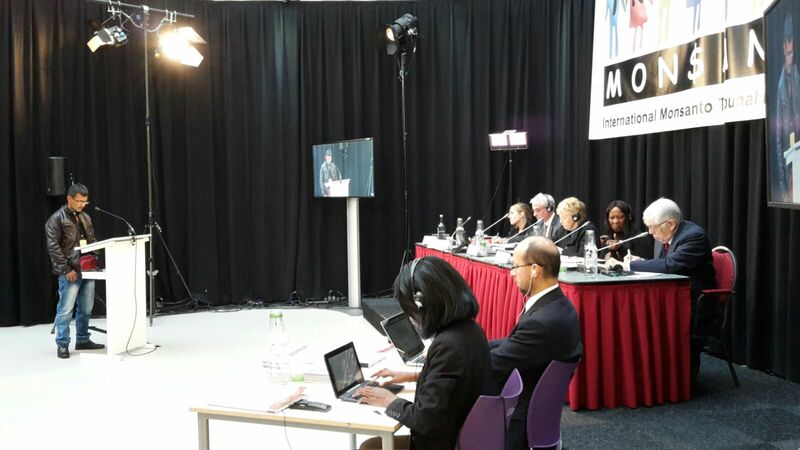 It is an educational tribunal, that can influence international human rights law. 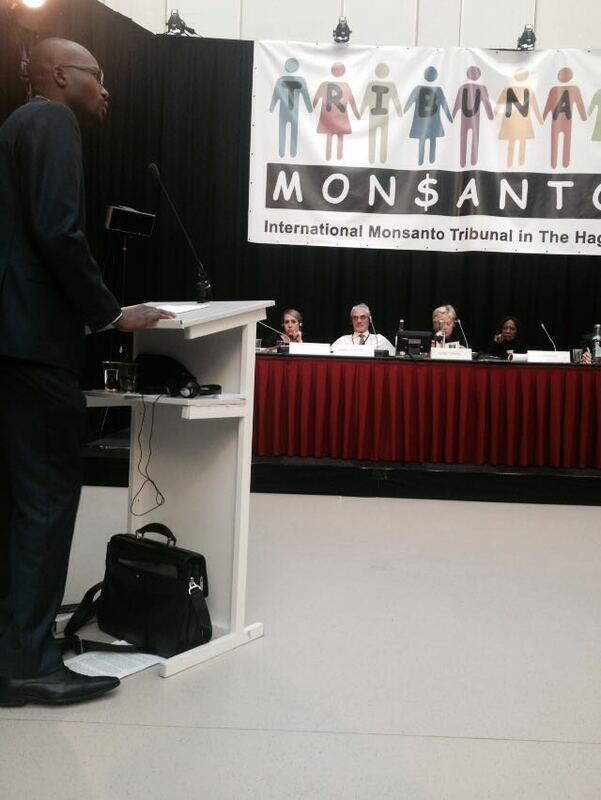 Indeed, the Monsanto Tribunal is a way for civil society to take the initiative of giving a voice to witnesses, as well as a way to enable the public to understand the impacts of Monsanto’s activities, and also to help international law improve, by offering new ideas, such as the responsibilities of business in respect to human rights, and by formulating new concepts. This is a difficult but essential education. It is important to refer to other cases of civil society tribunals in history. For instance, the Russell Tribunal [also known as the International War Crimes Tribunal], which was held in the context of the Vietnam War in 1966, was also a tribunal of opinion. 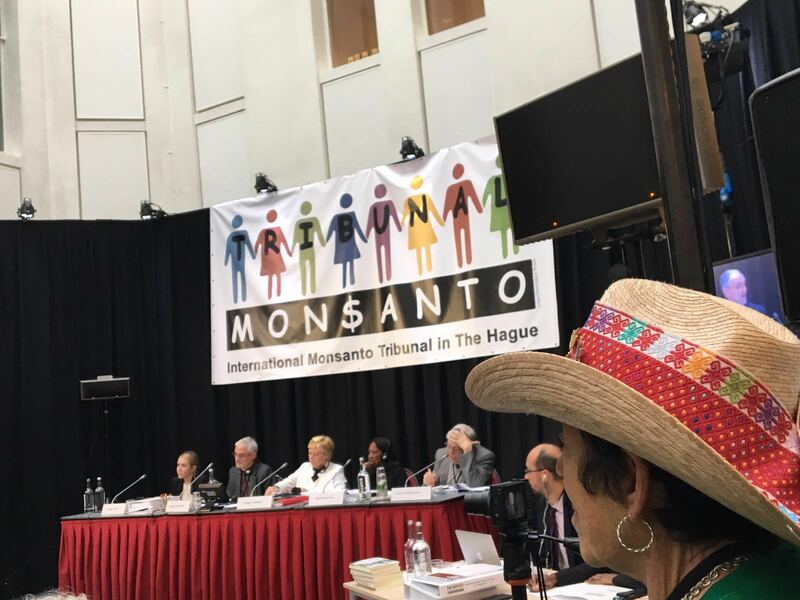 Regarding the Monsanto Tribunal, the judges’ advisory opinion will be delivered over the coming months and it will be sent to Monsanto and the United Nations. From this legal opinion, other jurisdictions will have the opportunity to get involved and other judges will step in. Without a doubt, it can be said that new questions, such as those concerning ecocide, could be taken into account by international law. Ecocide unfortunately still does not exist as a recognised crime, and in order for that to happen it firstly has to be precisely defined. Genocide is a crime against humanity aimed at the partial or total destruction of a group of persons because of their national, ethnic, racial or religious characteristics. Ecocide would be a “genocide” committed against the environment, environmental damage that would alter in a serious and long-lasting way the ecosystems upon which human life depends. The International Criminal Court in The Hague has just decided, on the 15th of September, to include concerns about the environment in its field of investigation, so steps in this direction are already being taken. 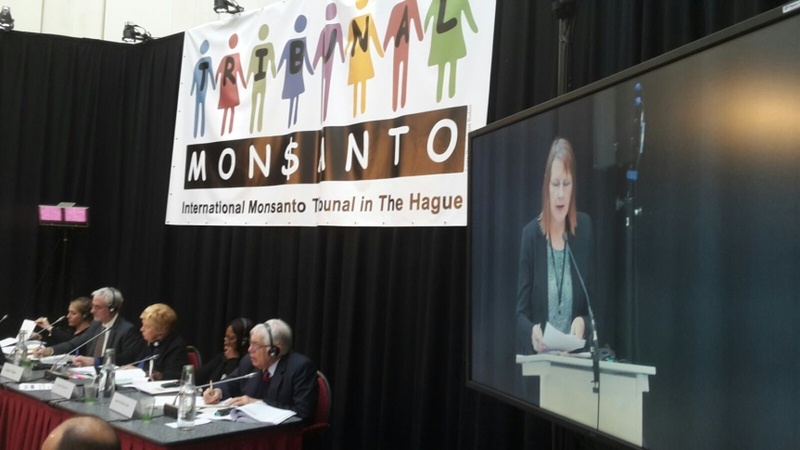 As Judge Françoise Tulkens, chair of the Monsanto Tribunal, said in an interview with Le Monde: “The issues of access to water and to a healthy diet are old. They are not new issues generated in the minds of angry activists. And these issues, such as the right to a healthy environment, are likely to become increasingly important with climate change. It is our duty to put the legal tools in place to deal with these problems. 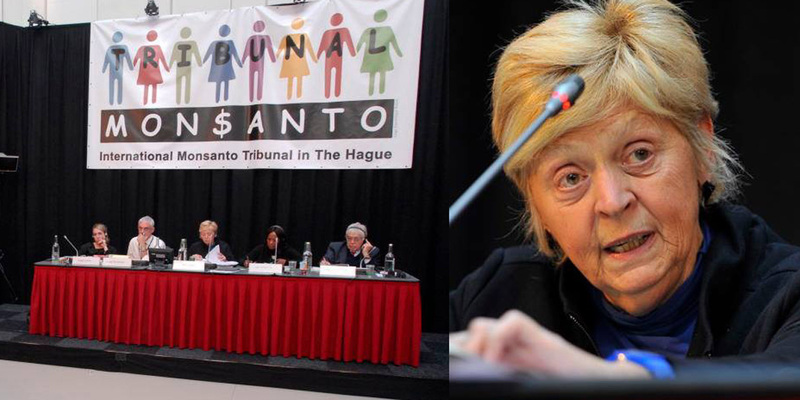 The Monsanto Tribunal is an essential step and tool in this process”. Monsanto and the Poison Cartel are guilty of crimes against our planet and humanity. This is the verdict from the People’s Assembly stated in the final press release. 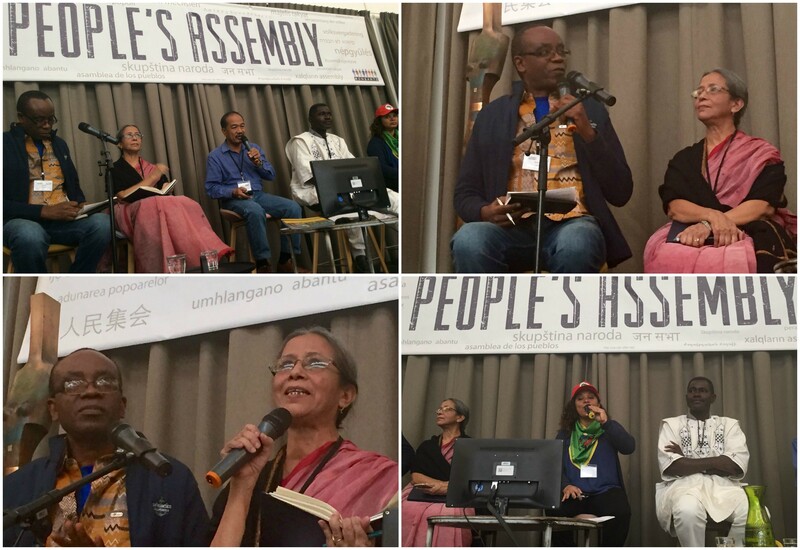 The People’s Assembly represented the platform through which independent studies and real experiences of farmers and consumers across the world were shared. After listening to witness and lawyers from the Tribunal, as well as to organisations, farmers, activists and common citizens from the People’s Assembly, the evidence is clear: “The poison cartel, which includes toxic makers such as Monsanto, Bayer, Dow, DuPont, etc are together destroying both our bread and our freedom. They are corrupting governments, violating nations’ sovereignty and imposing on our planet a model of greed, poison and corruption”. 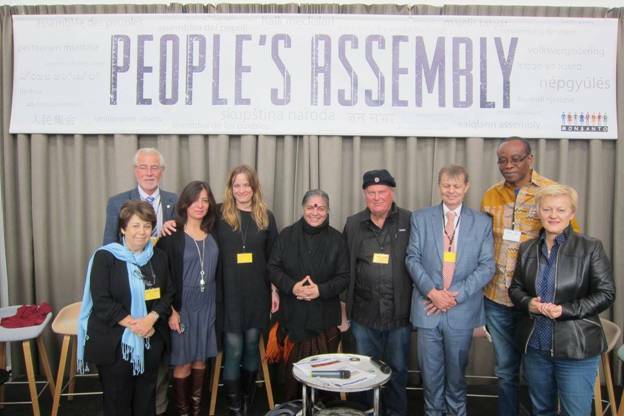 The People’s Assembly was therefore a crucial meeting for the future of humanity and the whole planet: “To steer our planet away from this destructive path, a Planetary Alliance for Earth Democracy has been formed under the People’s Assembly. Thousands of people from across the world have already joined us in this Alliance and a further one billion people will join in the next two years to reject patents on seeds, and poisons in our food and soil”. 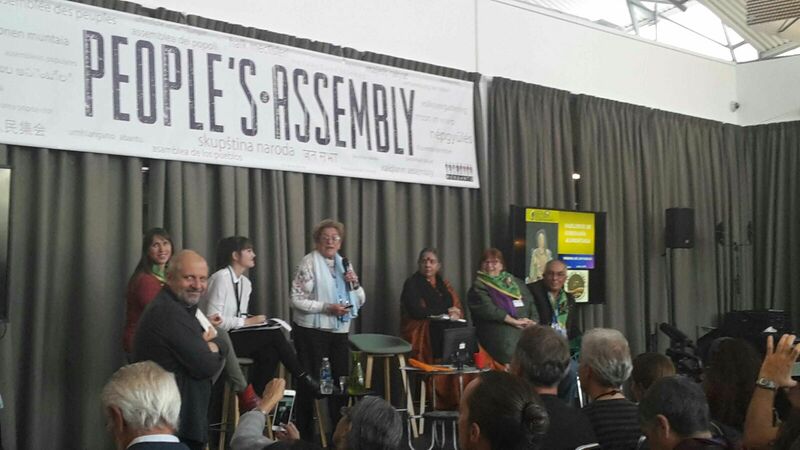 A new challenge to corporate power in defense of democracies and human and environment rights was launched in The Hague: “The Alliance is born to stop the crimes of Monsanto and of the Poison Cartel and block their attempts to hijack our democracy all over the world. The new generation of free trade agreements such as TTIP, TPP and CETA are proving to be means that Agri-business corporations have devised to control our life and dismantle our democratic systems and institutions”. 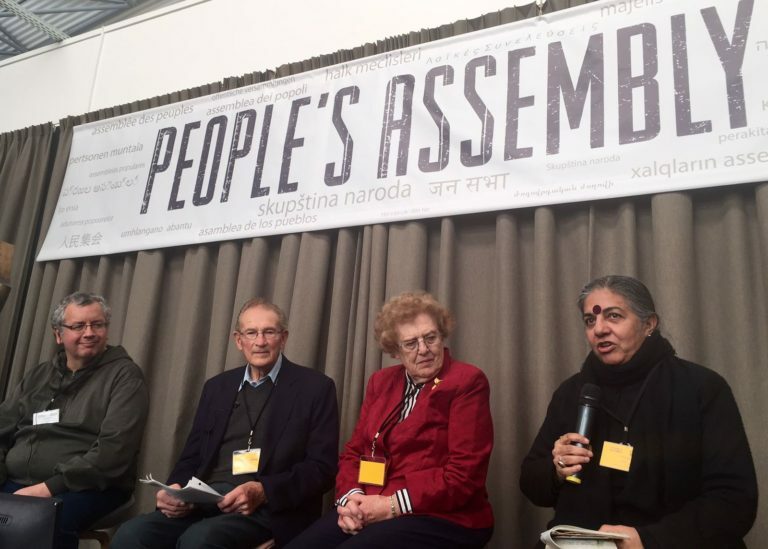 As Dr Vandana Shiva, founder of Navdanya and renowned environmentalist, stated “At this People’s Assembly, and at hundreds of others happening all over the world, people have passed their verdict. The poison cartel is guilty. They have destroyed life, plant and human health alike. They have disregarded all laws of nature and countries national legislation with the result of destroying biodiversity of our fields and our foods systems. As part of the Planetary Alliance for Earth Democracy we shall continue to resist attempt of these poison makers to control our food, our life and democracy”. 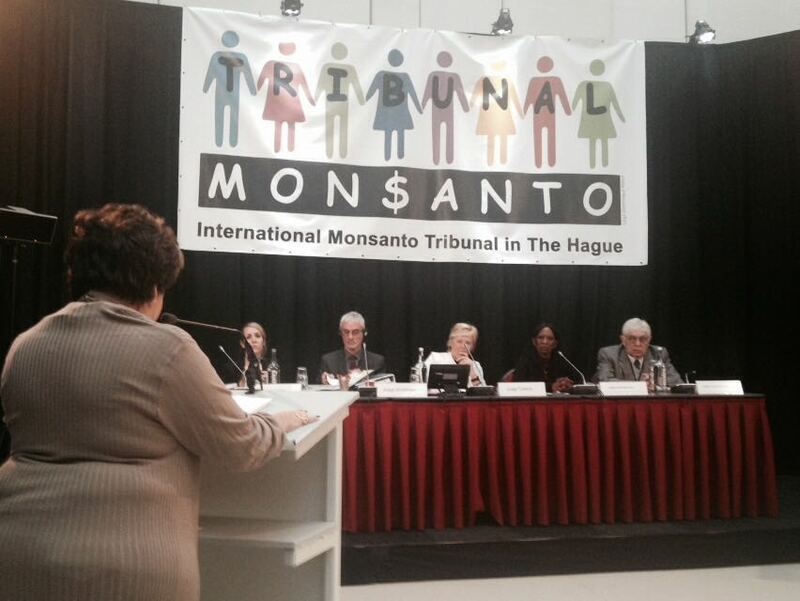 No Comments to "Monsanto Tribunal and People’s Assembly – Report"